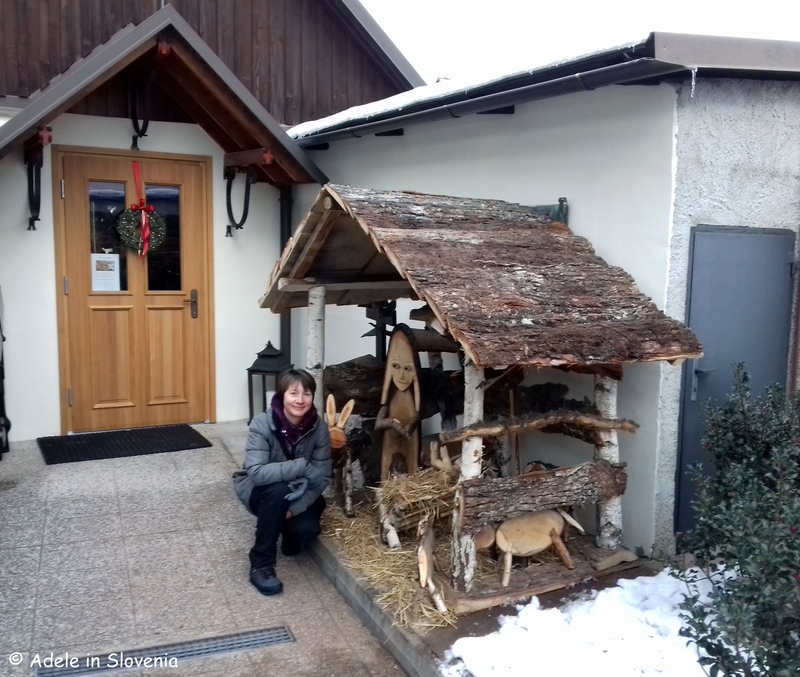 A Year of Slovenian Cultural Tourism – Radovljica and beyond! 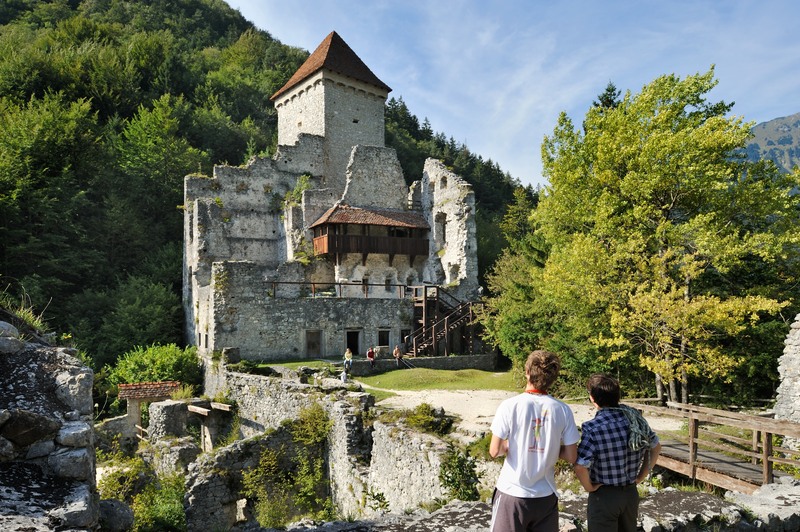 The year 2018 has been designated as a ‘Year of Culture’ for Slovenian tourism. 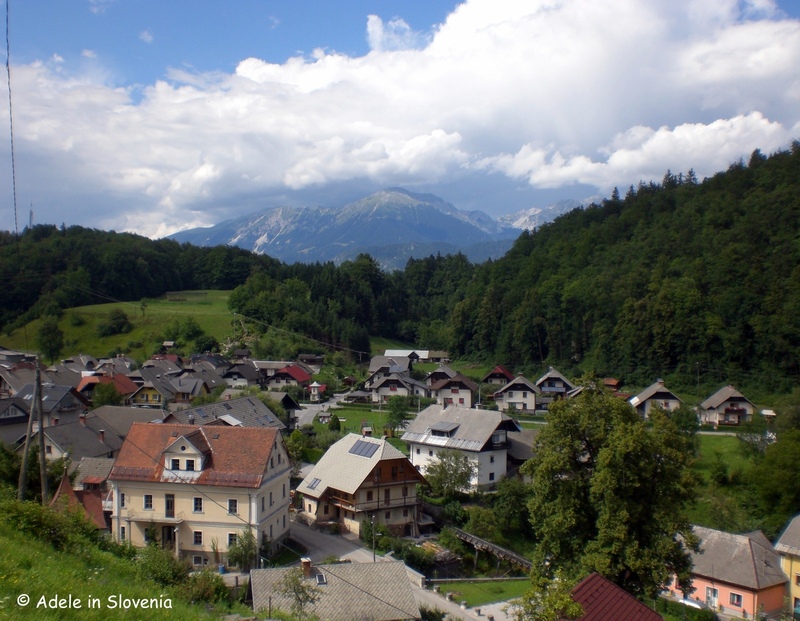 With this in mind, here’s a look at some of the numerous cultural attractions that the Radovljica area has to offer. Despite its modest size, as you will see, there are quite a few! I’m lucky enough to have them all right on my doorstep! 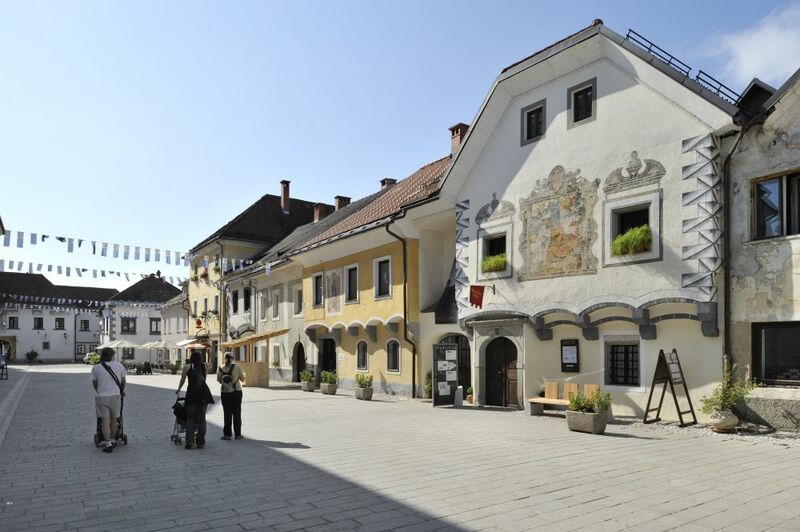 Linhart Square, the heart of Radovljica’s medieval old town, is home to the Šivec House Gallery, the Museum of Apiculture, and the Municipal Museum. 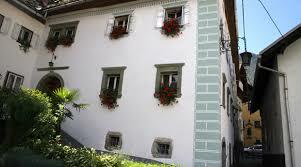 The latter two are housed in the imposing Radovljica Mansion. 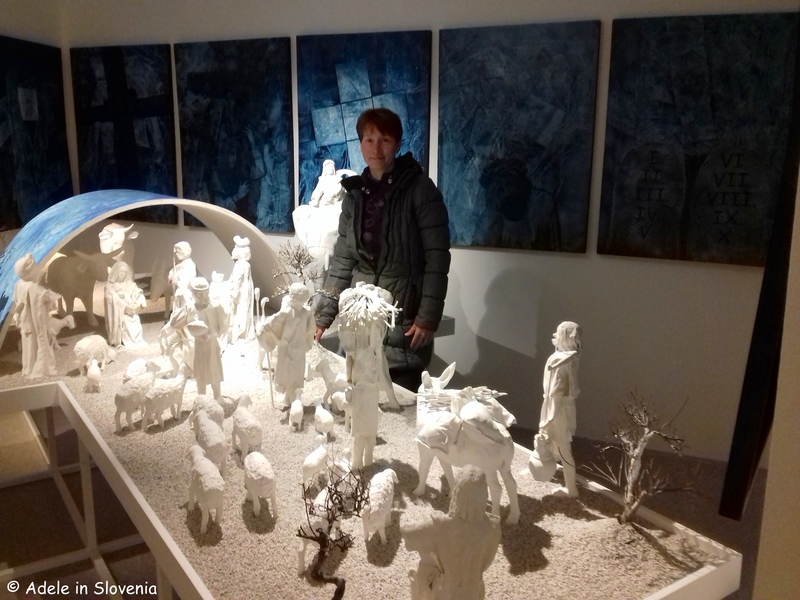 The Šivec House Gallery in Linhart Square is the place to be for all art lovers. 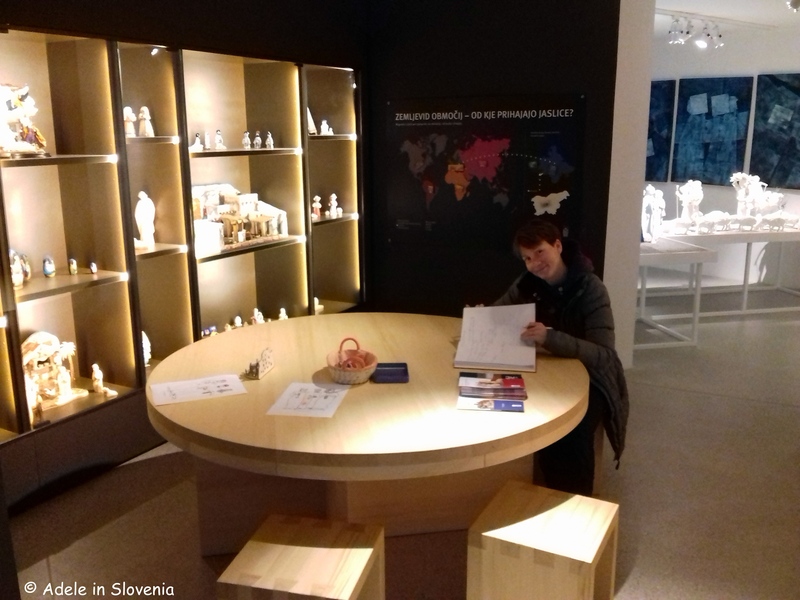 One part of the gallery is dedicated to a permanent exhibition of original illustrations, whilst the other hosts monthly exhibitions by fine Slovenian and foreign artists. 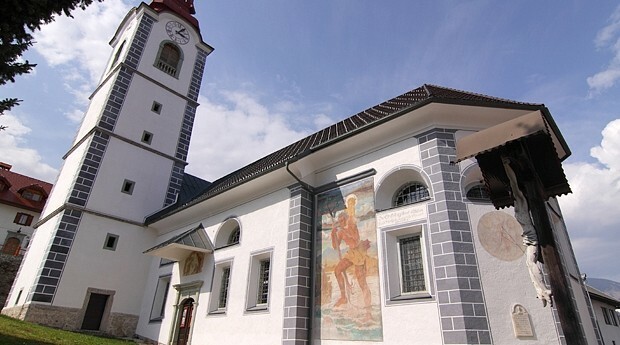 The building itself it also notable for its exterior fresco and the unusual layout and architecture of its preserved interior. 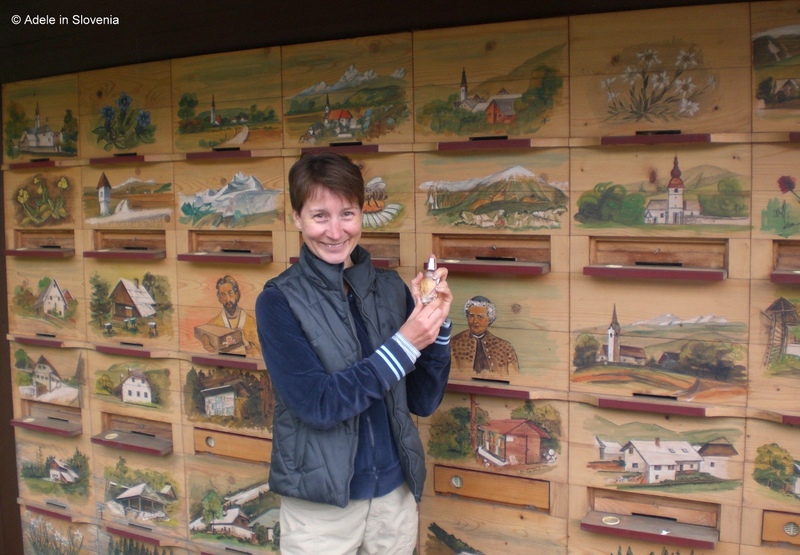 At the Museum of Apiculture, you can see a large collection of painted beehives front panels, including the oldest known in the world. Each of the painted panels tells a story. 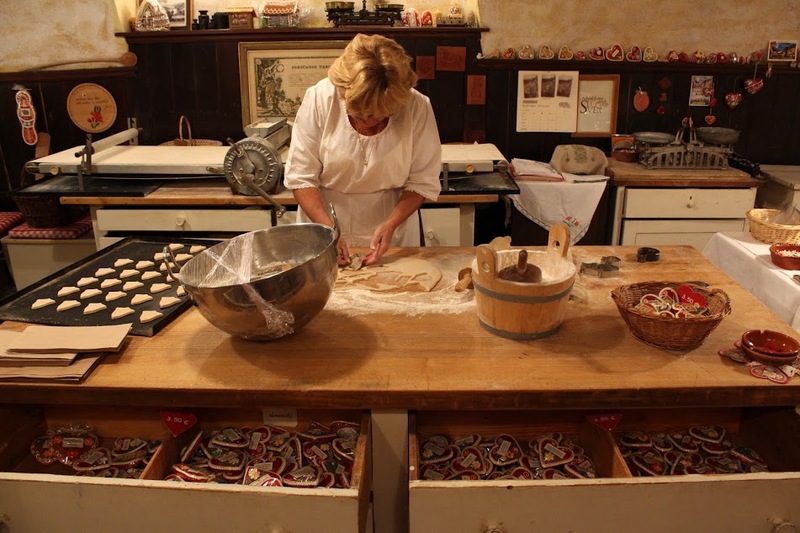 The Lectar Gingerbread Museum and Workshop is located in the cellar of Gostilna Lectar, a family-run restaurant and guest house with a tradition dating back to 1766. 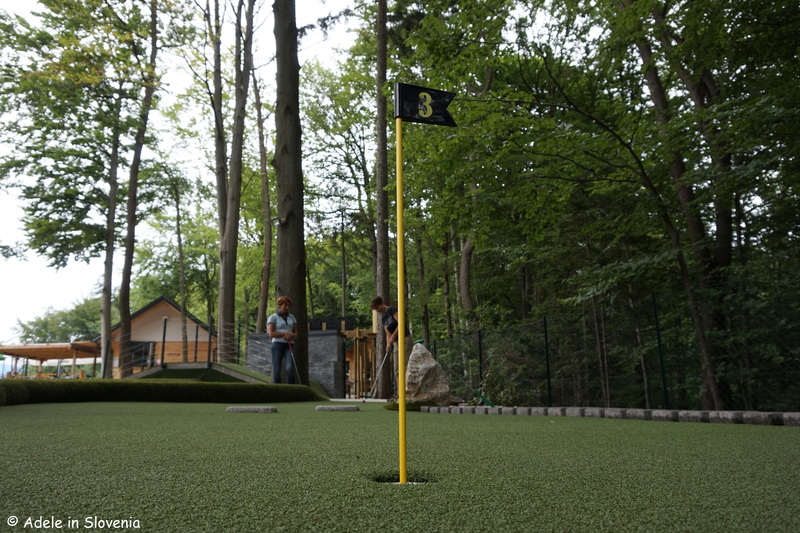 The current owners, Jože and Lili, have a real rags-to-riches story. 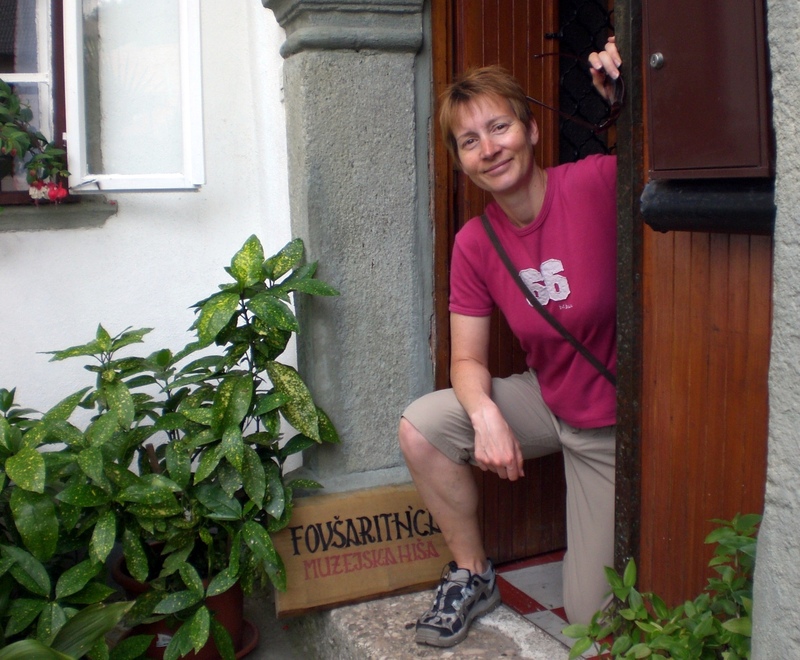 When they first arrived in Radovljica to take over running Lectar Inn they initially had a lease to rent the restaurant for a 10-year period, however, it soon became apparent that it was to become their life’s work and that 10 years would be nowhere near enough, so they enquired about the possibility of buying the property. At that time, they certainly didn’t have the financial means to do so as they additionally had to put a lot of money, time and effort into renovating the 500-year old house and also had 2 young children (which later became 4 children – including one set of twins). 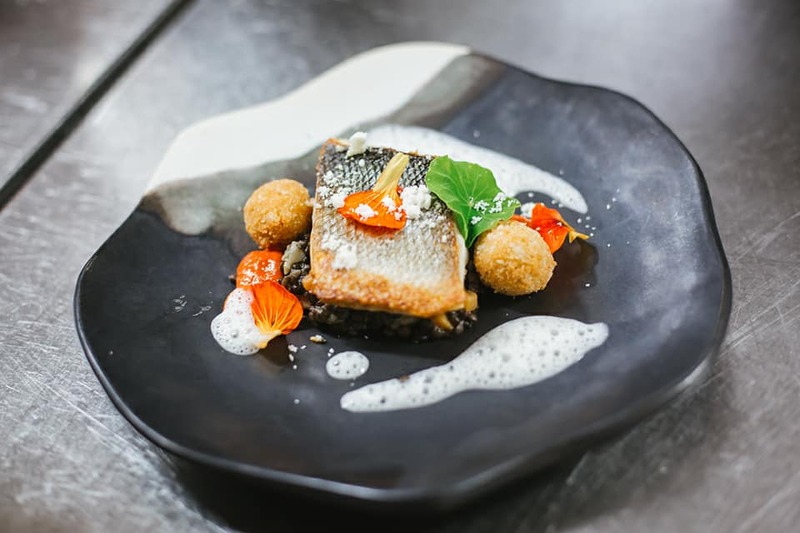 Over time, all their hard graft began to pay off and nowadays, in addition to the family, they employ 17 staff across the restaurant, Lectar live gingerbread workshop and guest rooms. 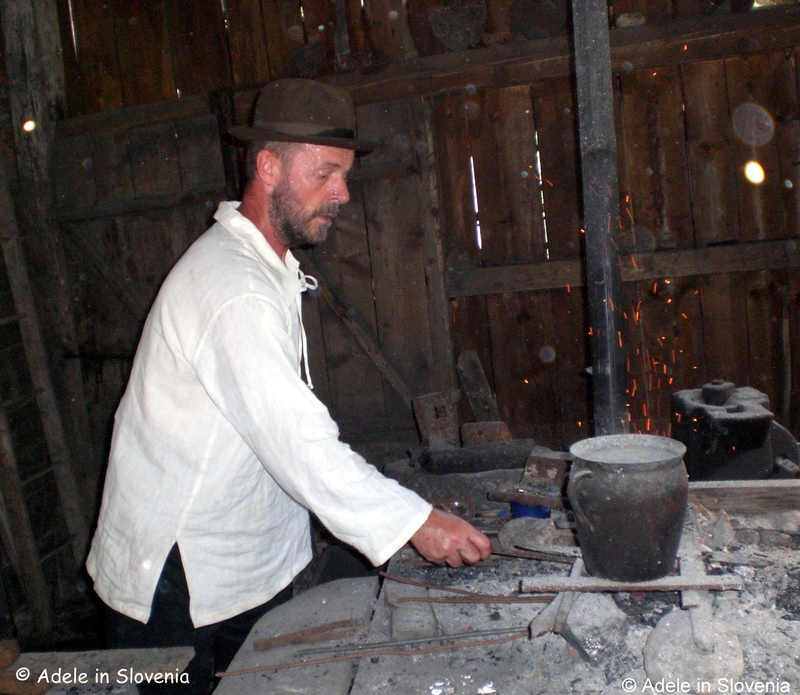 Among the other cultural attractions in the Radovljica area are the Iron Forging Museum and the Fovšaritnica Museum House in Kropa. 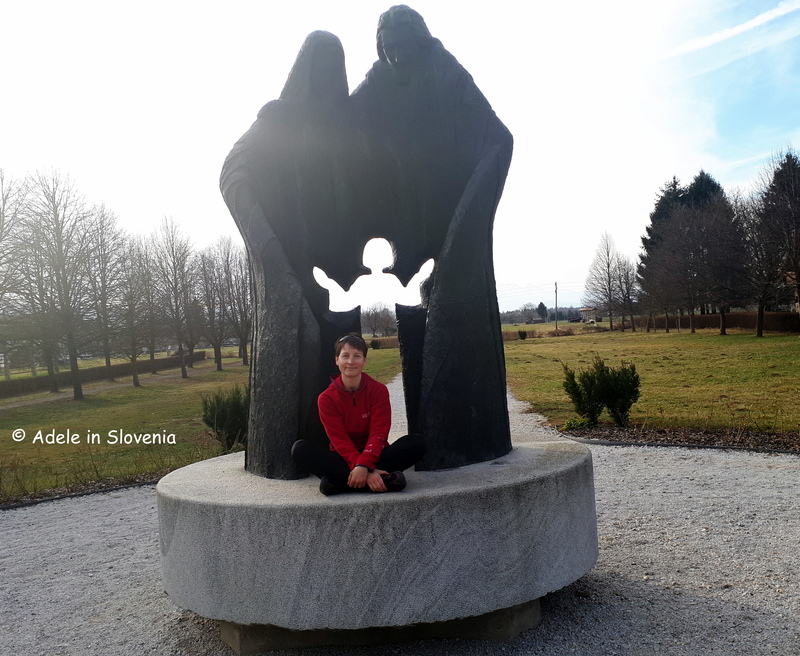 So, make 2018 a year to get to know more about Slovenia and its culture – after all, that is what makes every country unique! Radol’ca: Find Your Inspiration – I Found Mine! This new promotional video for Radol’ca has just been released. Watching it makes me so proud to be able to call Radovljica my home. 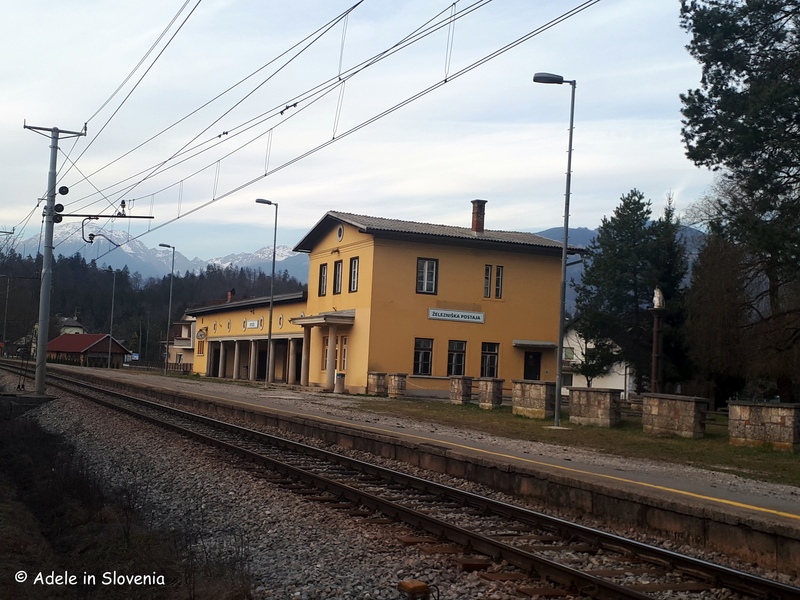 Oh, and by the way, just to make it clear, as I know it can be somewhat confusing, Radovljica is the name of the town; Radol’ca is the marketing name for the destination which includes Radovljica and the surrounding villages, such as Begunje na Gorenjskem, Kropa, Brezje, Kamna Gorica, and the smaller settlements in-between. 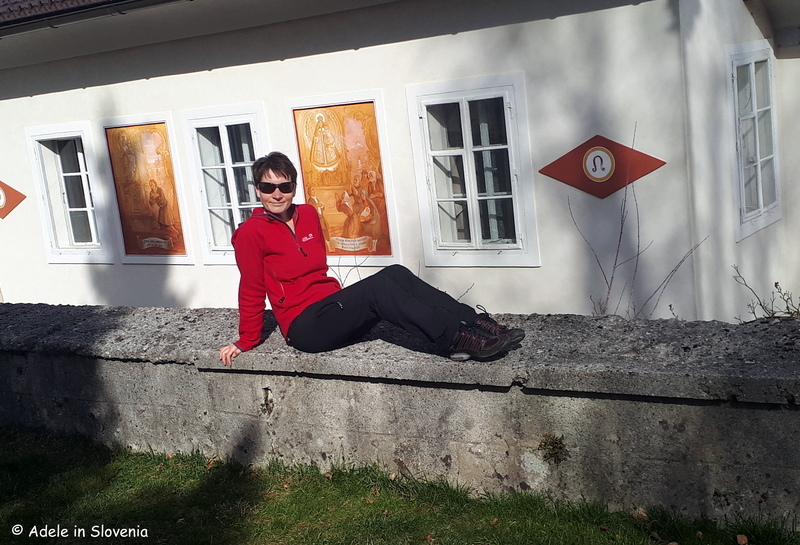 So, as another year of my life in Radovljica draws to a close, here’s a look back at just some of my personal highlights of 2017, which I hope will also provide inspiration for you to visit, or re-visit, the area next year! 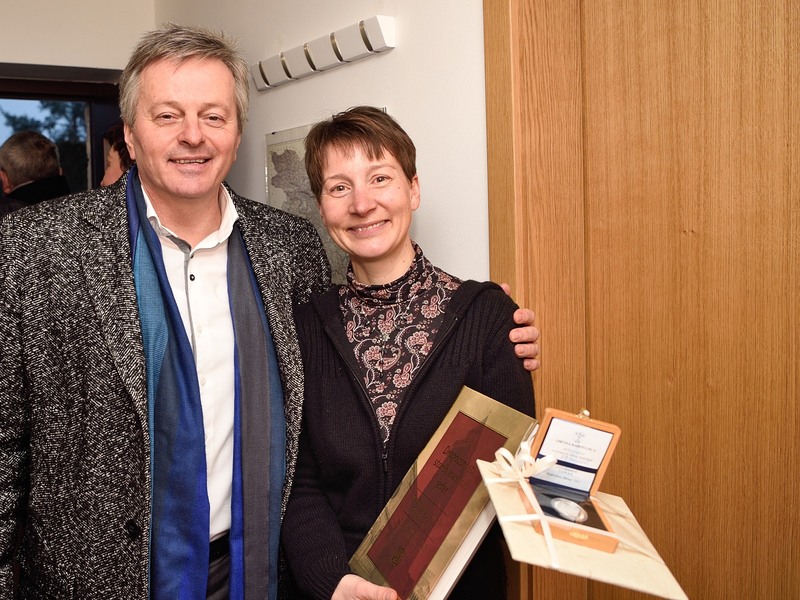 On the occasion, I was particularly proud to receive an award from the mayor of Radovljica for my contribution to tourism. 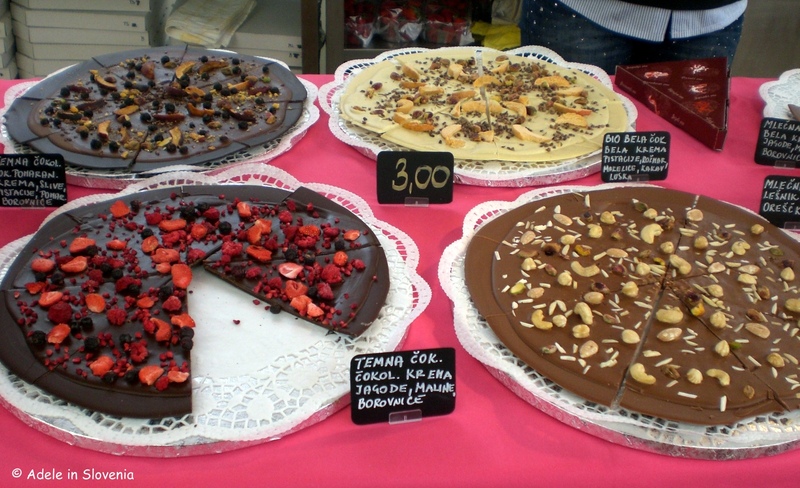 Spring is chocolate time in Radovljica – time for the Radovljica Chocolate Festival, the biggest of its kind in Slovenia. Note the date for the next festival in your diaries now: 20th – 22nd April 2018! 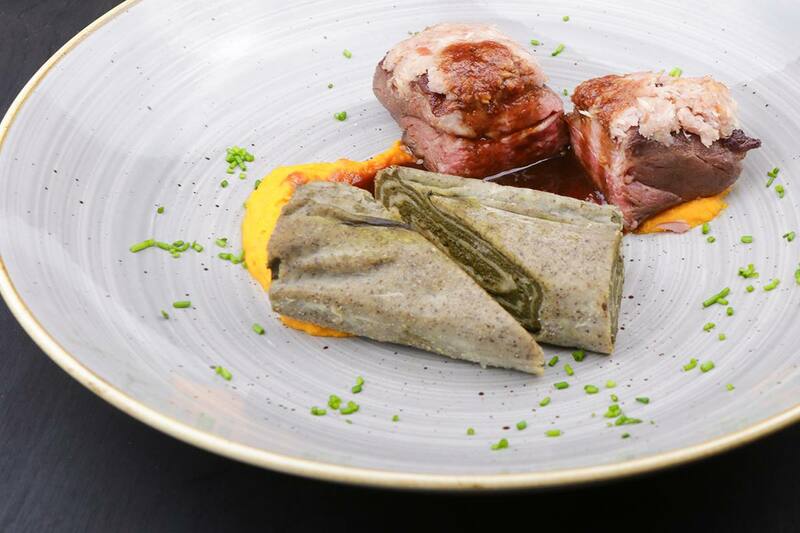 Late autumn was time for very tasty, very tempting, and very popular Taste Radol’ca! And that brings us to winter, which started earlier this year (boohoo!) and, to me at least, already seems too long! 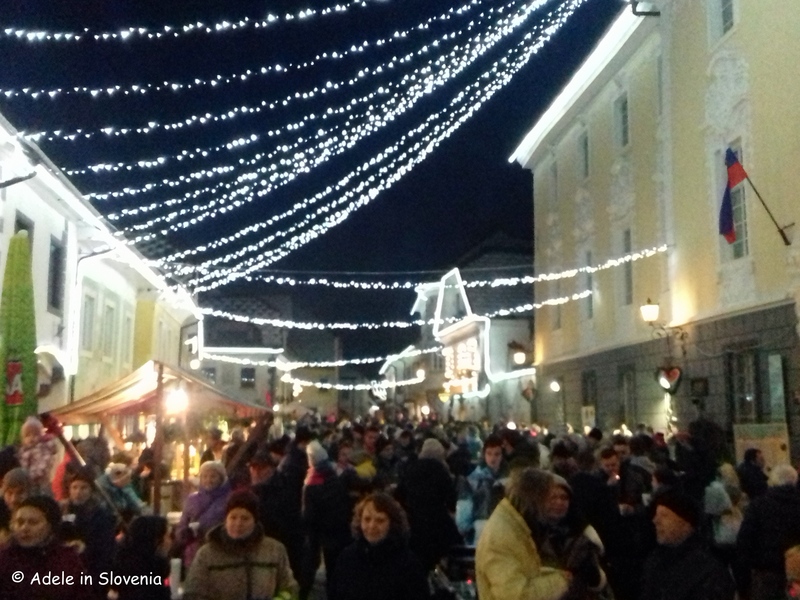 But it does have its pluses, too, such as the joyous festive atmosphere on the occasion of the switching of of the Christmas lights in Linhart Square – the heart of Radovljica’s old town. 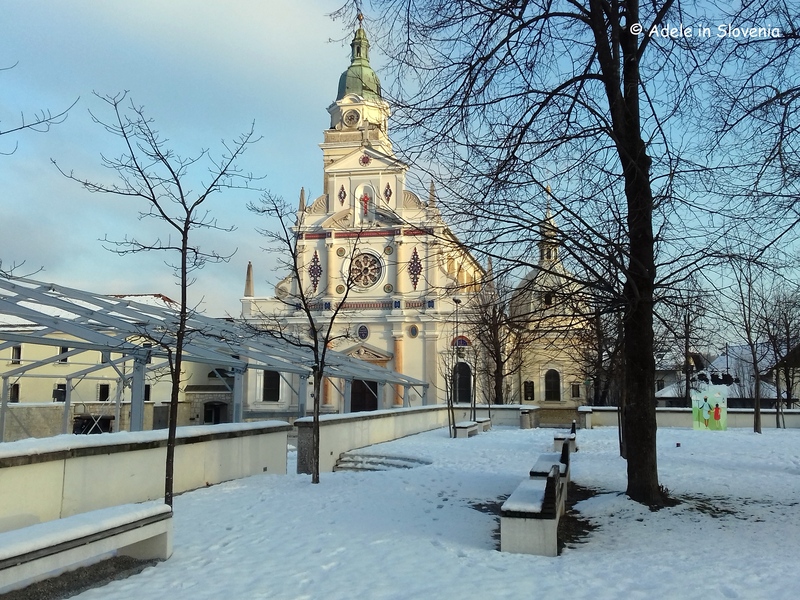 Here you can check out the whole Festive December in Linhart Square programme. 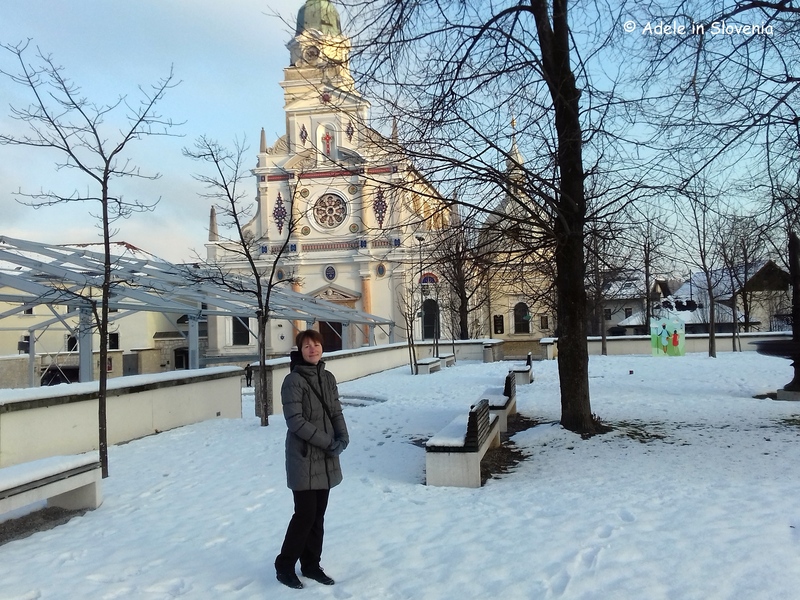 And that brings me to the end of another Radovljica year, though, of course, it’s not the end of the journey! 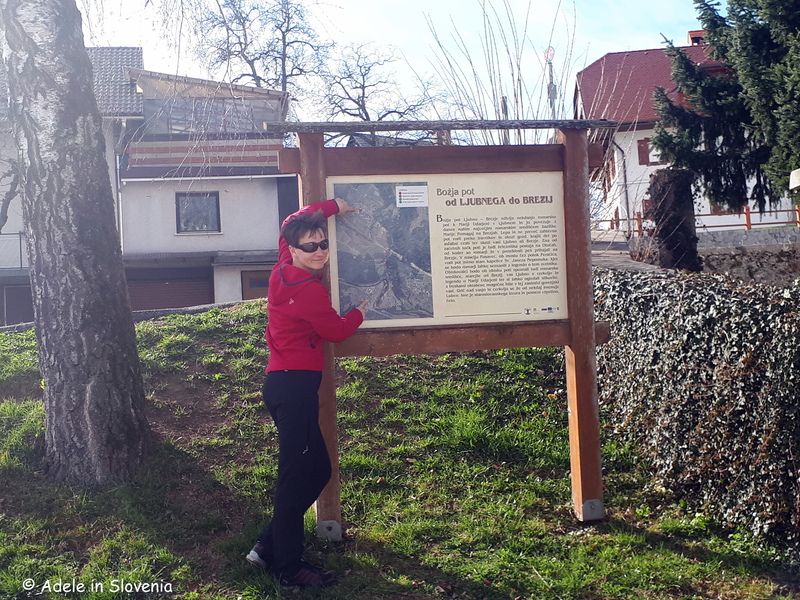 I hope you will continue to be inspired by my Adele in Slovenia blog posts, will continue to read, and you, too, might ‘Find your Inspiration’ in Radovljica! 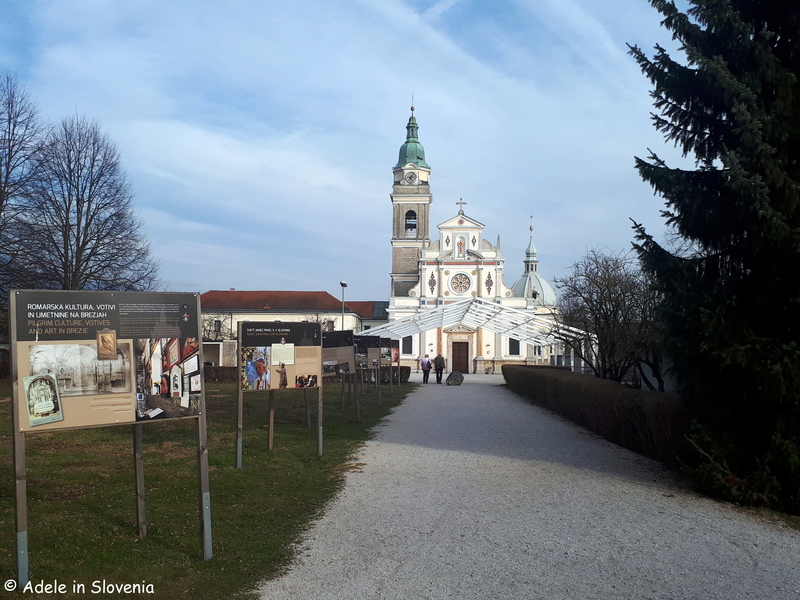 At this festive time of the year, what could be more apt than visiting the Nativity Museum – a museum crammed full of nativity scenes from all over the world – at Slovenia’s national shrine, the Basilica of Mary Help of Christians in Brezje. 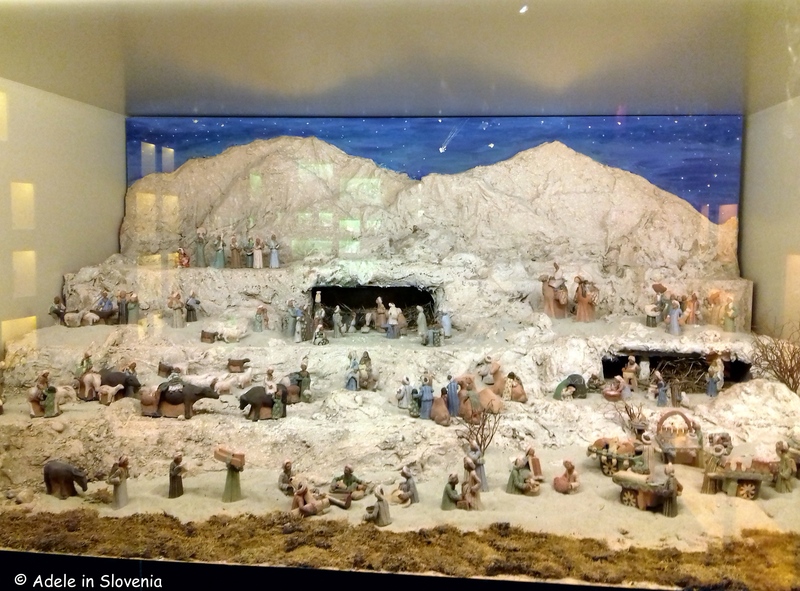 The museum is located in a separate building at the rear of the church where, even before you set foot inside, the first nativity scene awaits! 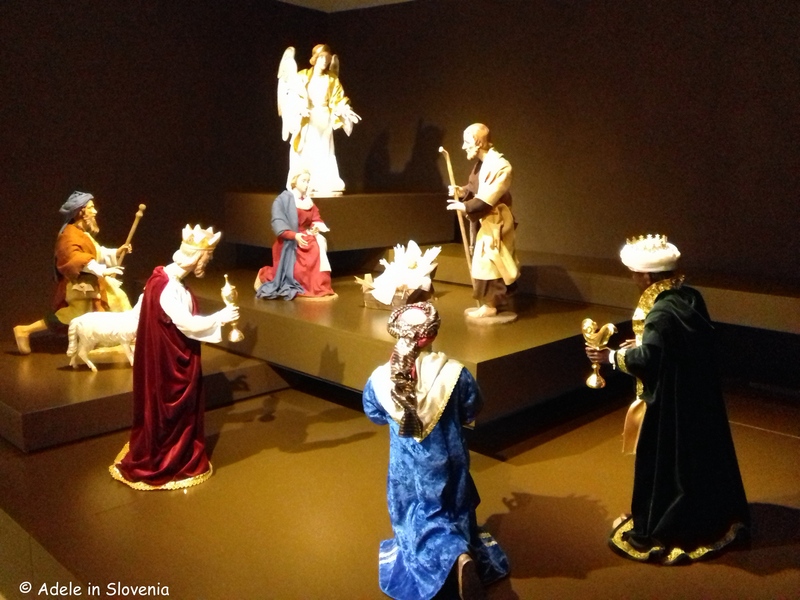 The recently renovated and enlarged Nativity Museum has been open in its present form since December 2016. 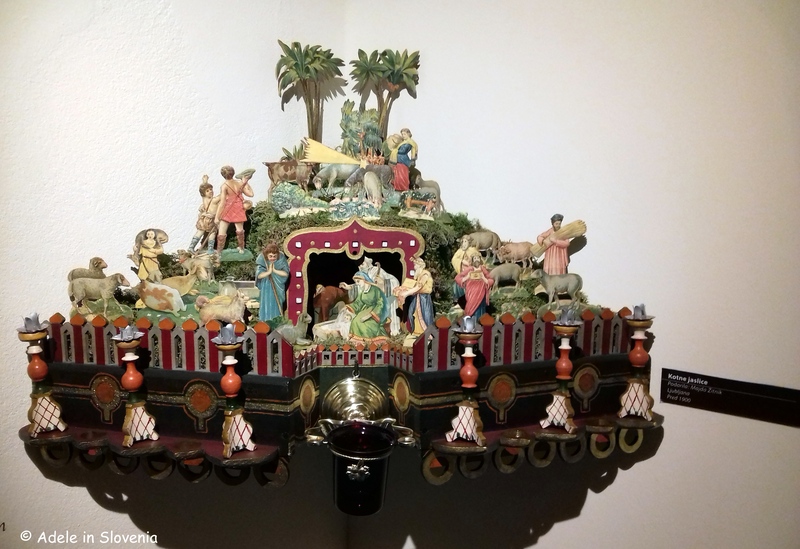 In that time over 20,000 people have already visited and over 100 new nativity scenes have been donated to the museum’s already-rich collection. After viewing the exhibits, you can take time to sit, reflect, listen to music and sign the visitor book. The museum is open daily, except Mondays, year round; from April – October from 9am-7pm and from November – March from 9am-6pm. Visit the basilica’s official website for more information – available in (an impressive!) eight languages. 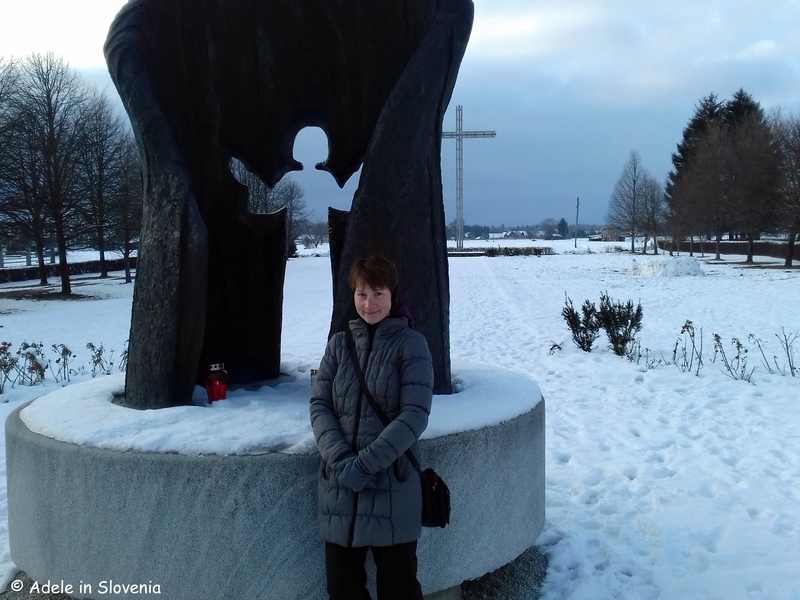 Whilst in Brezje, you should also take time for a walk around the village to see the basilica, and the giant cross and monument opposite the museum, as well as the village’s other points of interest. The museum is number 4! In 1988 the then Church of St. Vitus was elevated to the status of minor basilica by Pope John Paul II, who also visited in 1996. 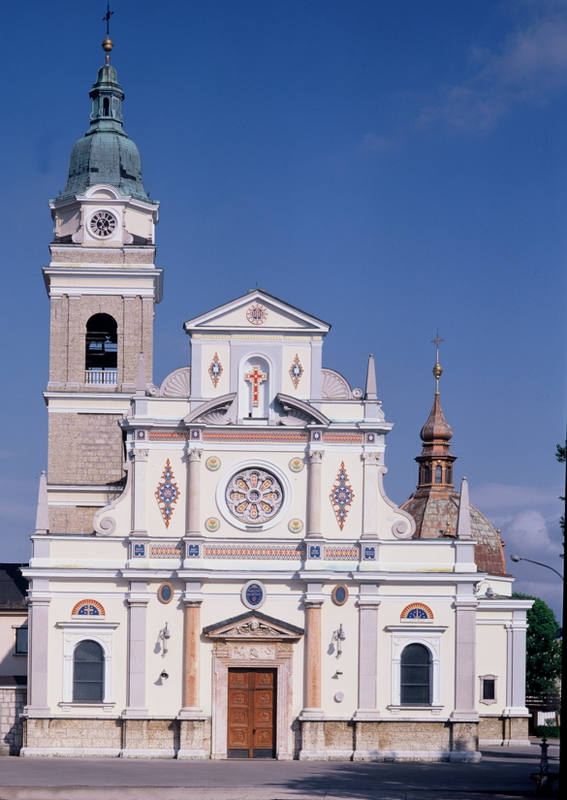 The basilica has become a popular pilgrimage destination to where people flock from all over Slovenia and further afield, too. 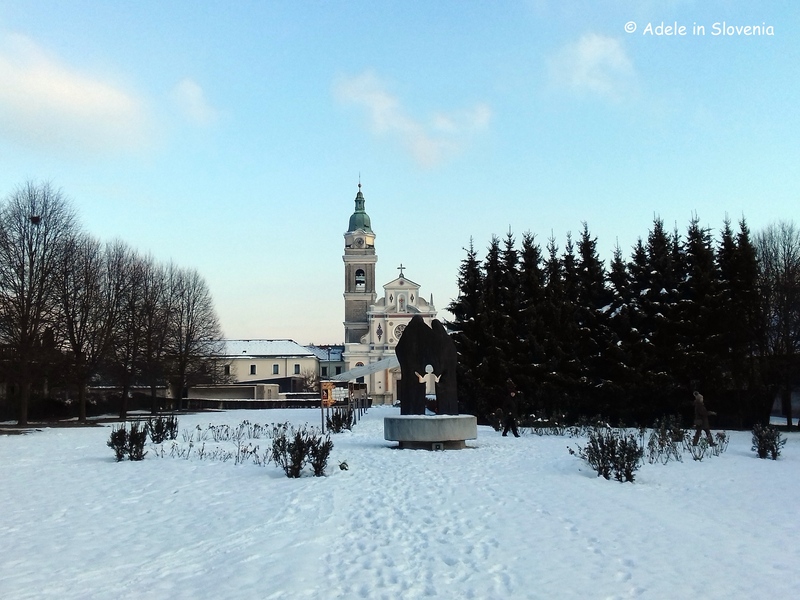 I have to admit, despite my dislike of the white stuff, Brezje does look lovely in the snow, wouldn’t you agree? 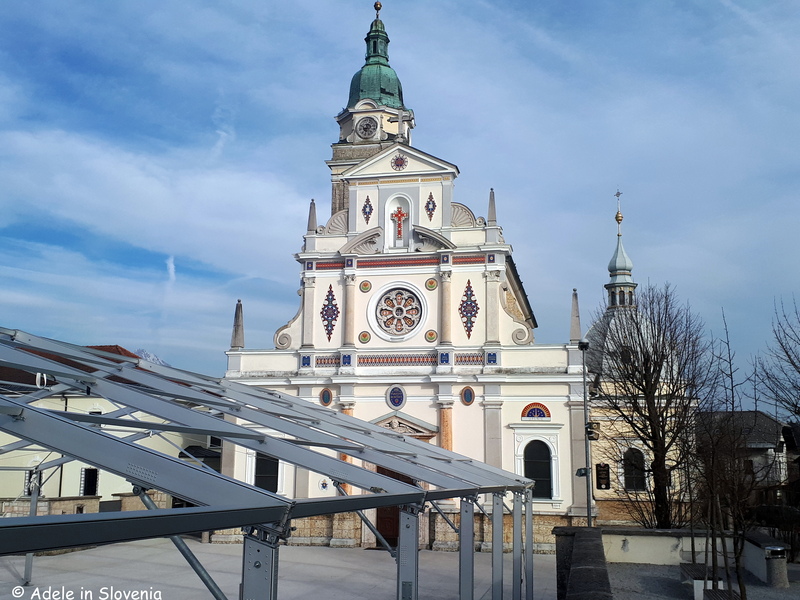 You can also click here to find out more about the basilica, the museum and all of Radovljica’s other cultural and natural sights of interest. 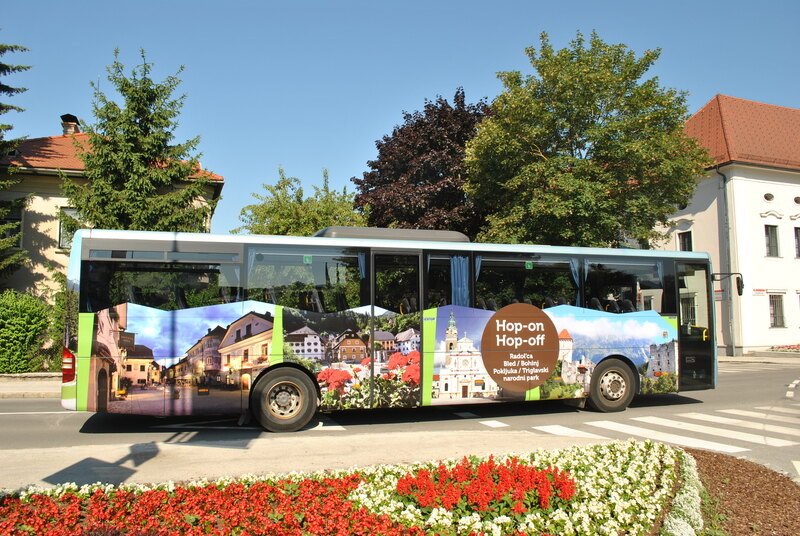 The Radol’ca Hop-On Hop-Off tourist bus will begin operating on Tuesday 4th July and will run every Tuesday and Thursday during July and August. This year there is an even wider range of places to visit and more things to see and do. As in previous years a day ticket is great value at just 5 euros. You can get on and off the bus to visit sights of interest along the way, or just enjoy the ride! 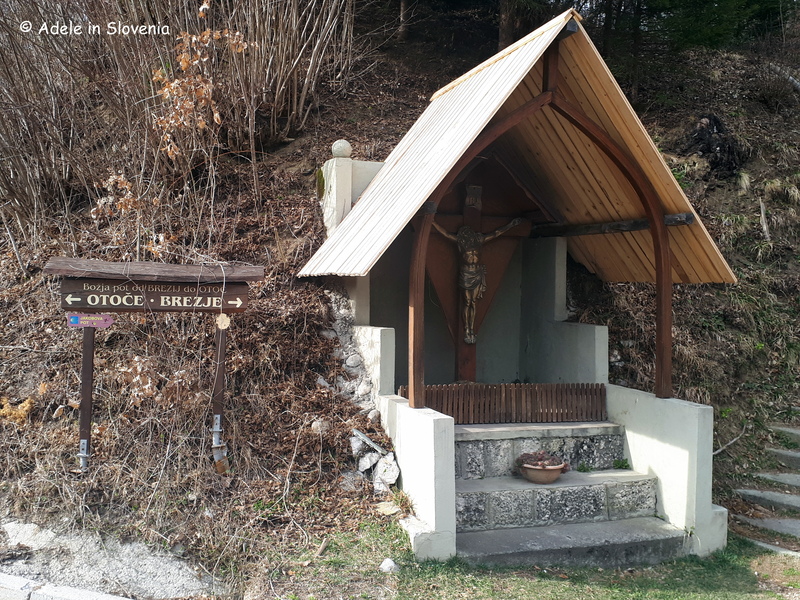 On Tuesdays the route is Bled – Radovljica – Kropa, with additional stops at the Šobec Camp, Lesce, Lancovo and Kamna Gorica. 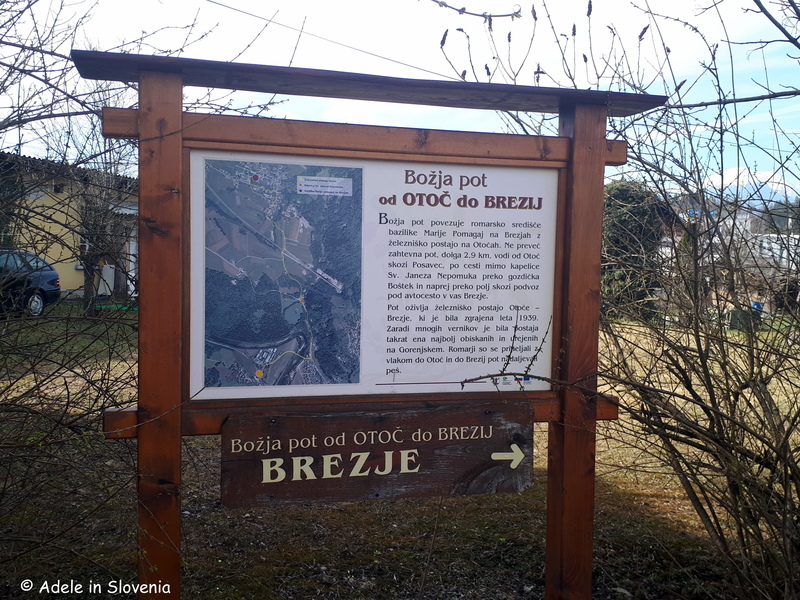 On Thursdays the route is Bled – Vrba – Žirovnica – Begunje – Brezje, with additional stops at Breznica, Spodnji Otok and Podvin. To whet your appetite here’s a preview of just some of the things you can see and do along the way. 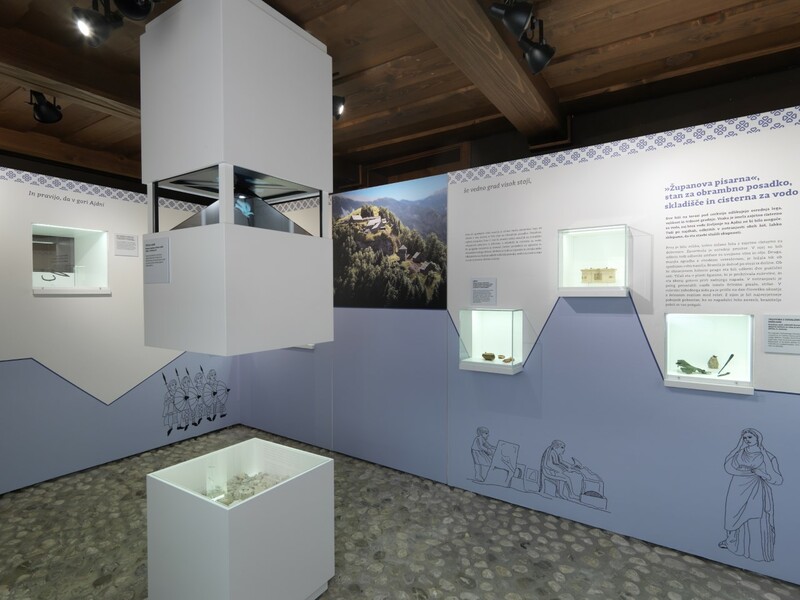 For the first time, this year the bus route includes Žirovnica, where you can visit the new Ajdna Museum Room to find out more about the Ajdna archeological site beneath Mt. Stol where remains were found from a Late Antiquity village dating back over 1400 years. 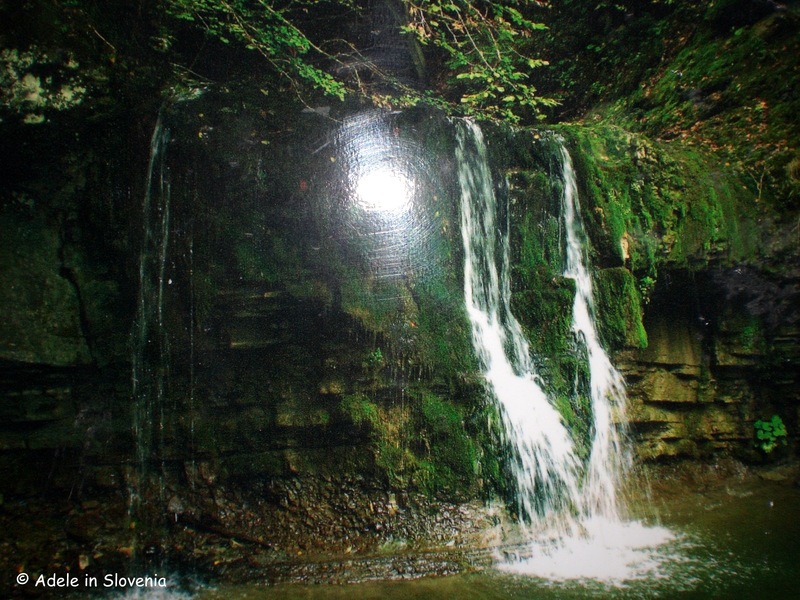 On especially hot days, a trip to the Završnica valley is an ideal way to seek some tranquillity and shade. 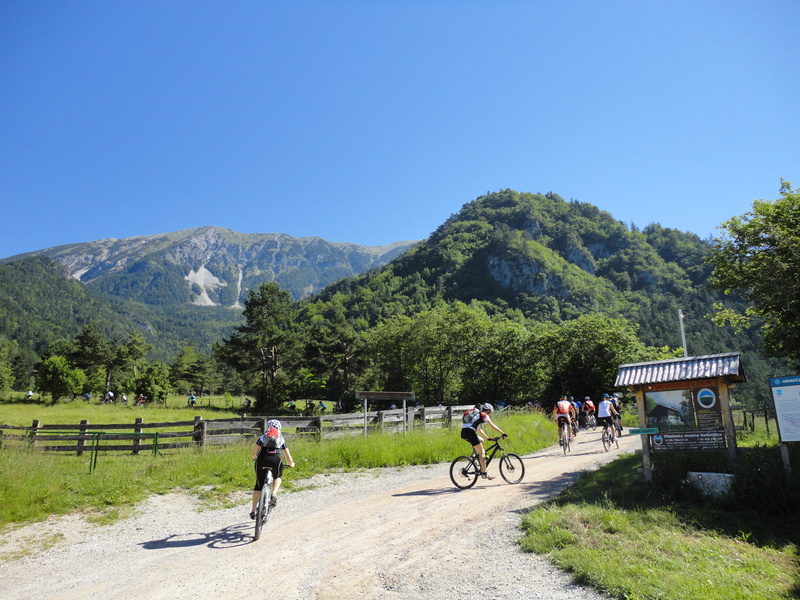 The valley is also a start point for great hikes and bike trips in the Karavanke range, including to the highest peak, Mt. Stol. 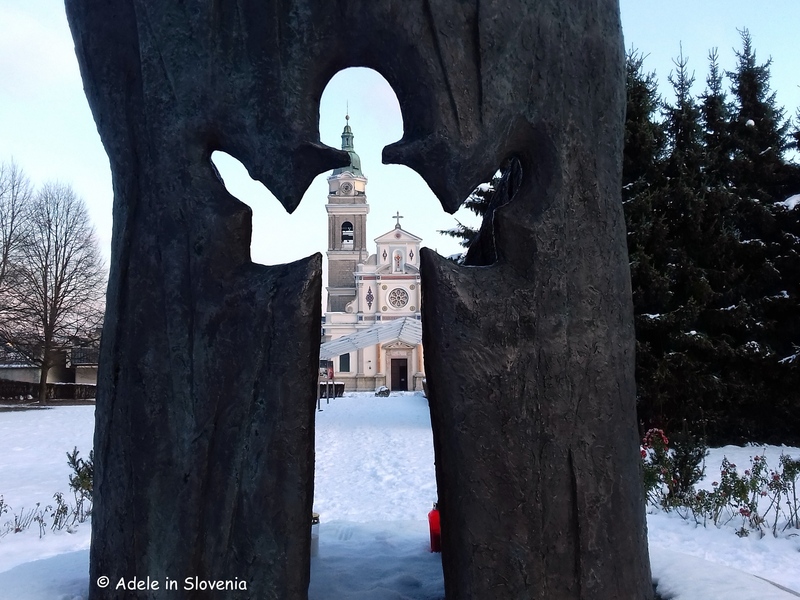 In Brezje you can see the Basilica of Mary Help of Christians, and the Nativity Museum, or take a walk on the Path of Peace to the Peračica waterfall. 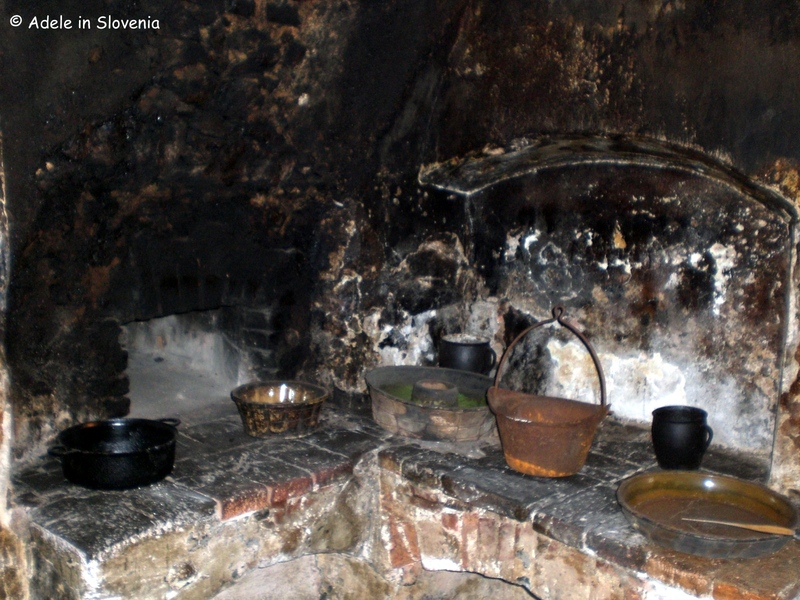 In Kamna Gorica you can walk through the village to see its many waterways, and walk up to the Sextons’ House Museum, which contains an original black kitchen. 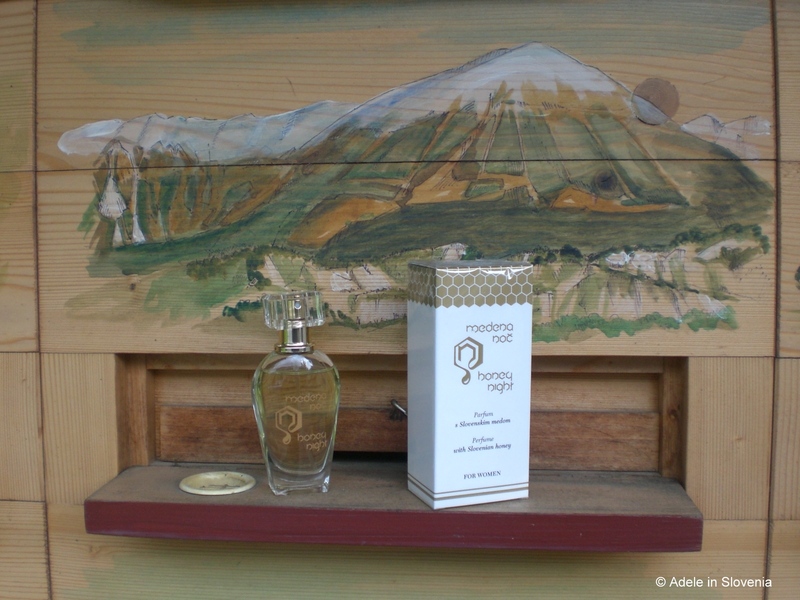 Its position offers great views over the village and towards the Karavanke mountains. 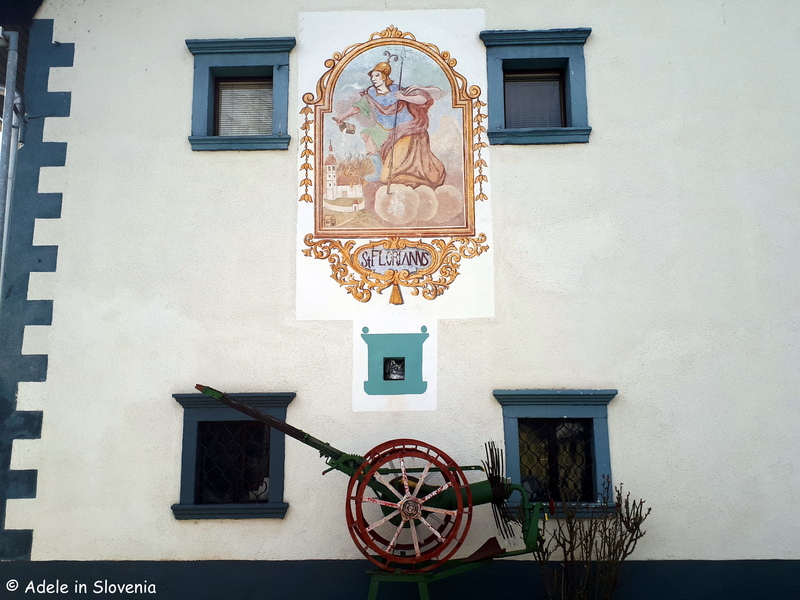 In Kropa you can visit the Iron Forging Museum, take a stroll through the village to see the former ironworkers houses, or visit the Vigenc Vice Blacksmith to watch a demonstration of manual nail forging. In Radovljica itself there are numerous things to see and do including a visit to the Lectar Gingerbread Museum and Workshop, the Museum of Apiculture, the Šivec House Gallery, or simply enjoy a stroll through the well-preserved medieval old town and sit at the viewpoint and enjoy the views of the Sava river, the Jelovica plateau and the Julian Alps. 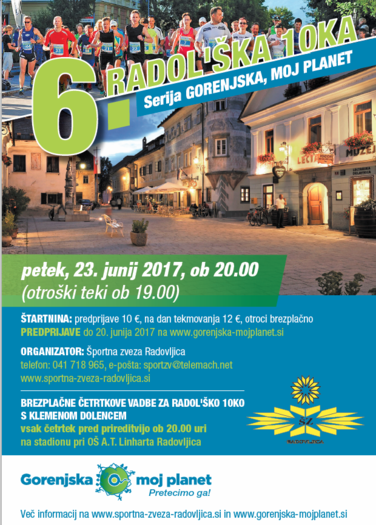 What’s On in Radovljica June 2017 – A Lot! 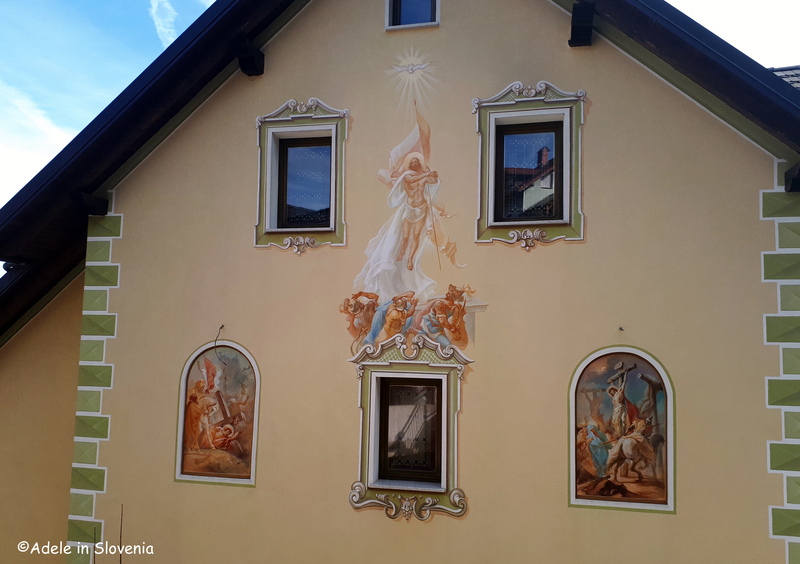 Here’s a round-up of the latest news and events taking place in June 2017, of interest to both visitors and locals, in my lovely home town of Radovljica as well as the surrounding towns and villages. I apologise in advance for the long blog, but there’s so much going on! 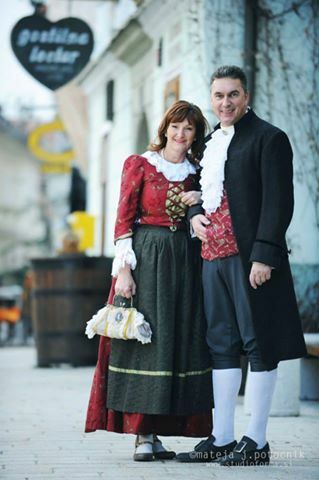 Every Tuesday you can join a FREE guided tour of Radovljica’s historic old town centre. 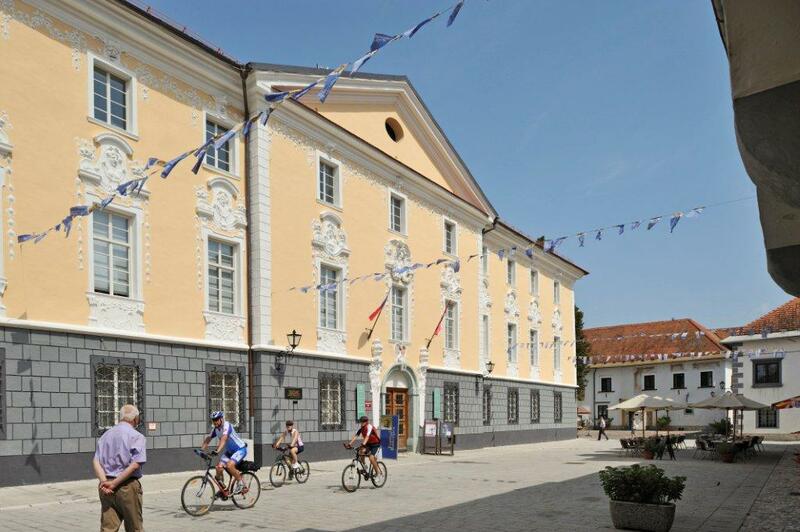 The tour begins at 10am at the Radovljica Tourist Information Centre at the entrance to the old town in Linhart Square (Linhartov trg). 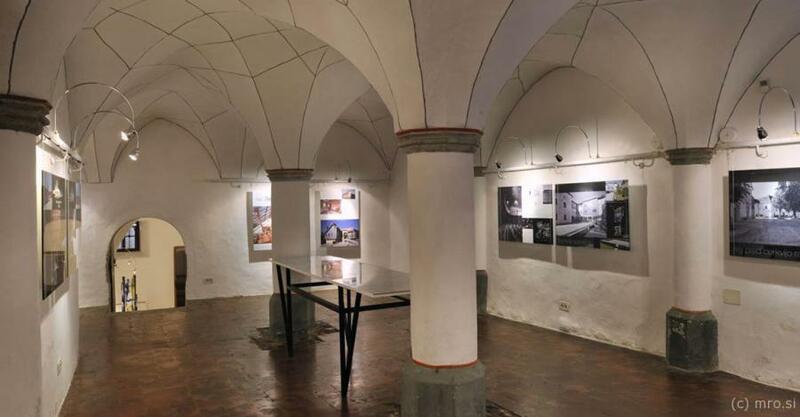 An exhibition titled ‘Terra Mystica’ is on view in the Radovljica Mansion in the old town until 2nd June. 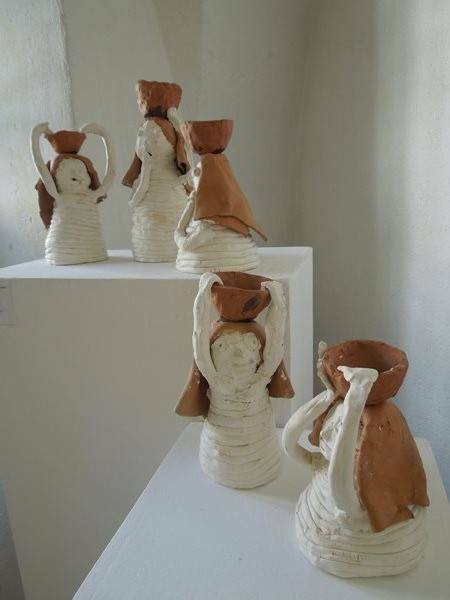 The exhibition showcases products made at the children’s ceramics biennial. 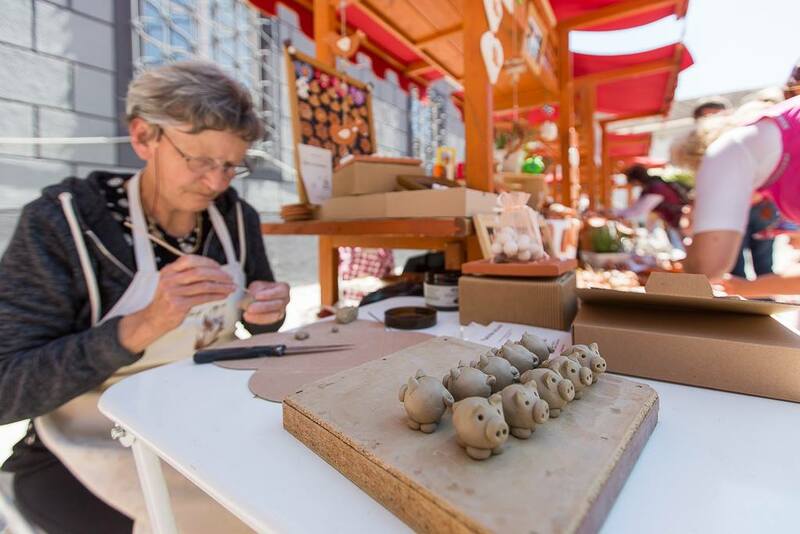 Talking of ceramics, the Festival of the Strength of the Earth (previously known as the Ceramics Festival) took place last Saturday. 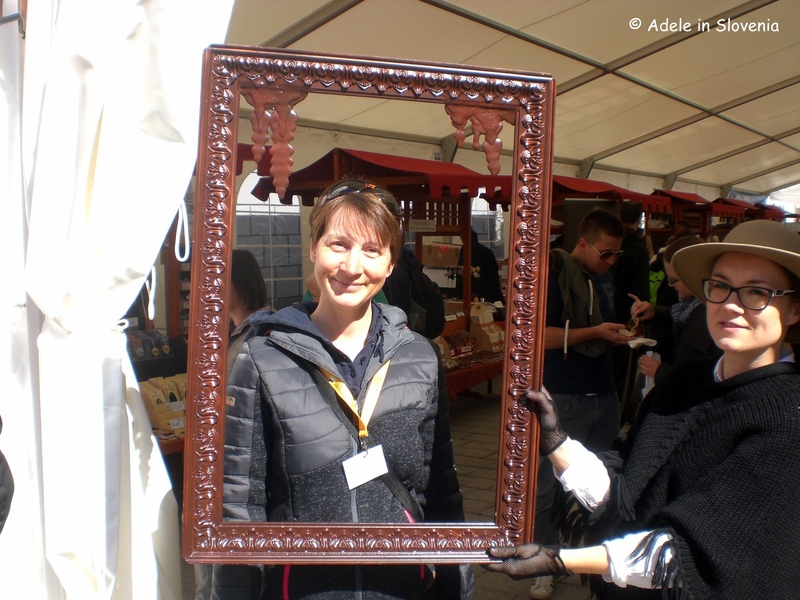 The main market event took place in Linhart Square, where visitors could see and buy products such as ceramic ware, herbs, seeds, natural cosmetics, and teas. 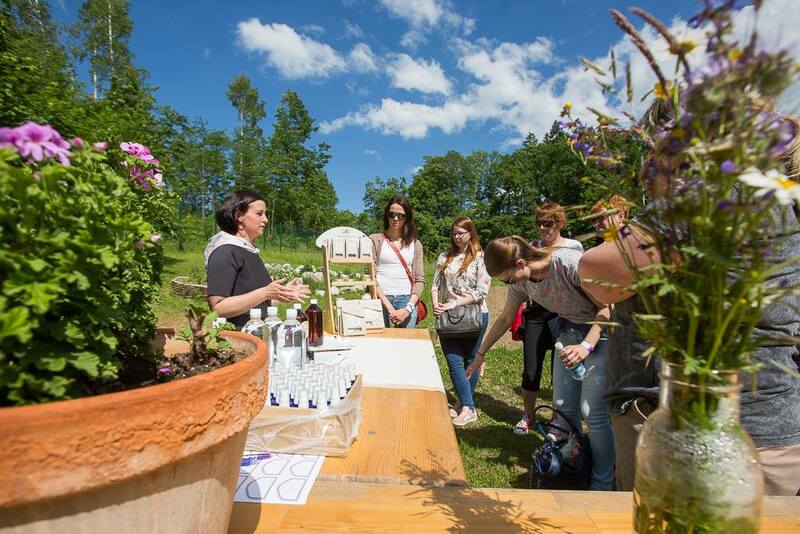 Whilst workshops took place at the biodynamic garden at the town primary school. 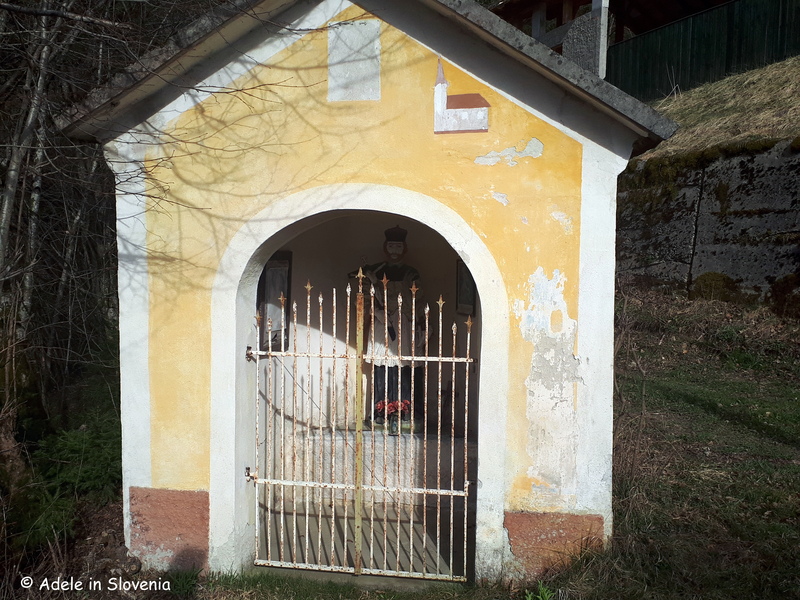 The annual month-long Vurnik Days (Vurnikovi dnevi) begins on 1st June in memory of the architect Ivan Vurnik who was born in Radovljica in 1884. 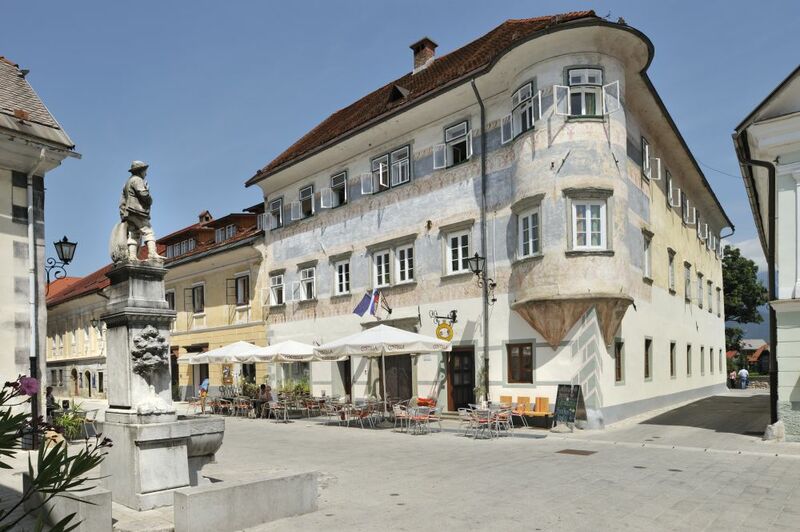 Vurnik helped found the Ljubljana School of Architecture and, together with his wife, Helena Kottler Vurnik, they went on to design many notable buildings in Radovljica, as well as further afield in Slovenia. 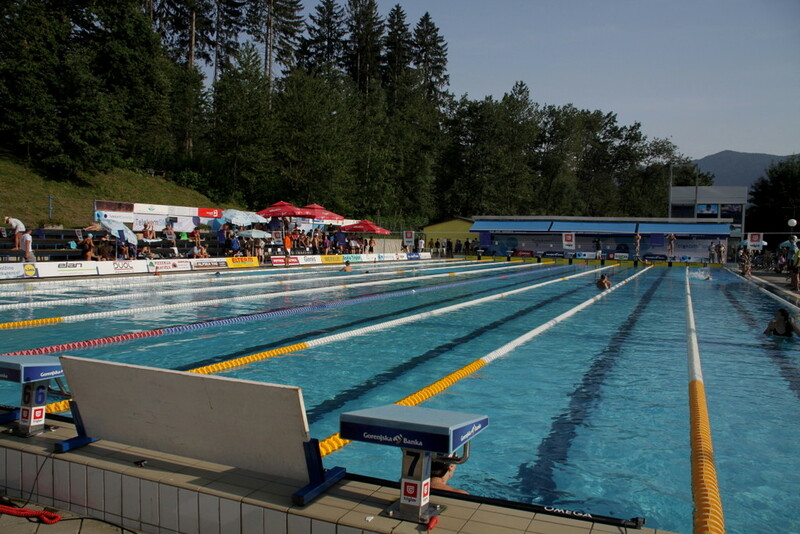 Radovljica’s swimming pool was built in 1932 and is considered one of Vurnik’s most notable projects. The most distinguishing feature, at its time considered a daring feat of engineering and architecture, was the high diving platform. 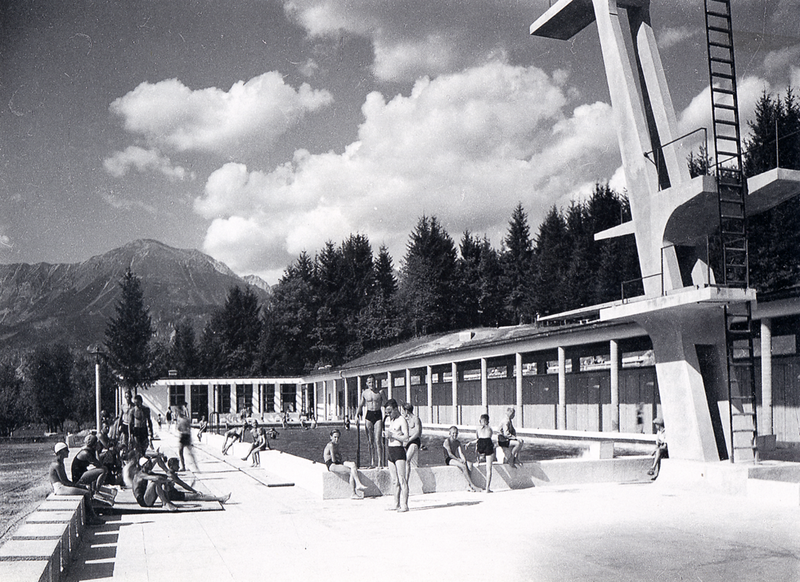 It was demolished in 1966 but Radovljica’s Olympic-size swimming pool lives on today, in the same location, though in a somewhat more modern form. The first Outdoor Cinema (Letni kino) will take place at Linhart Hall (Linhartova dvorana) on Friday 23rd June at 9.30pm when the film The Beatles: 8 Days a Week will be screened. And even better, this kick-off film, that you can enjoy sitting outdoors in the courtyard, is FREE. 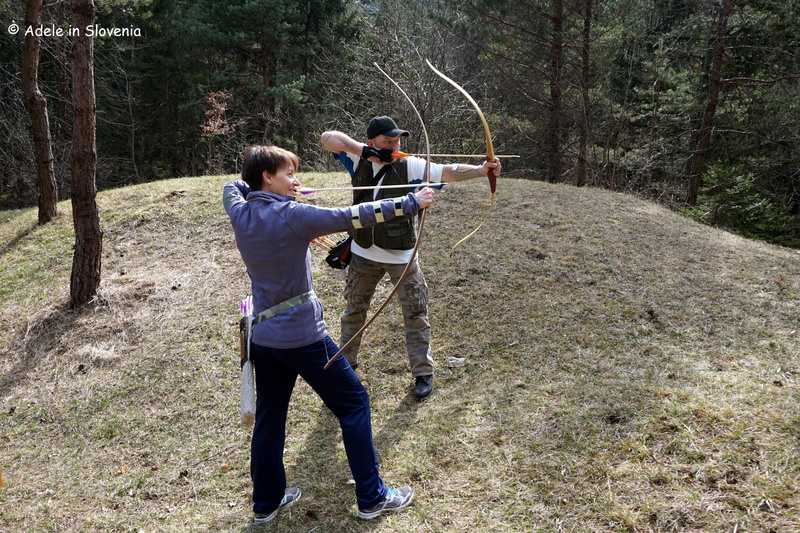 On 23rd June the annual Midsummer’s Eve Festival will take place in the shelter of the ruins of Kamen Castle in Begunje na Gorenjskem. 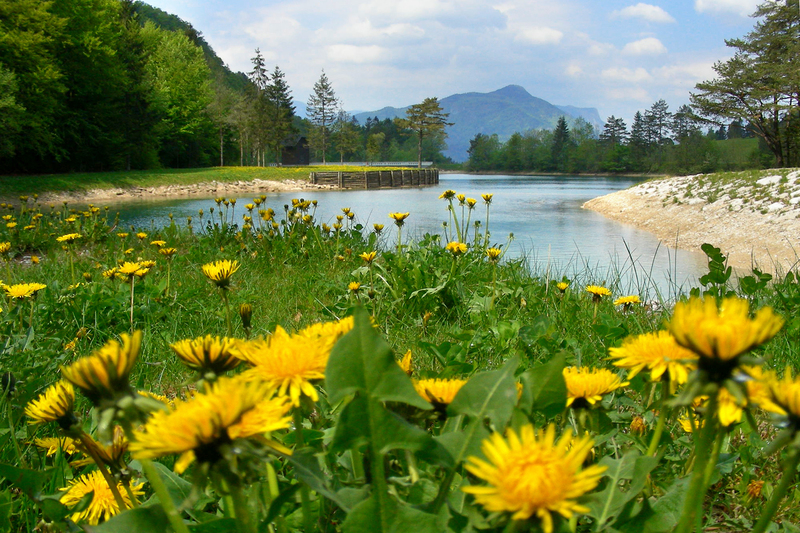 And all this is in addition to the usual natural, historical and cultural sights of the Radovljica area – the historic old town centre, the stunning views of the Karavanke mountains, the Julian Alps, the Sava river, the countless walking, hiking and cycling routes, and the delicious local food on offer at Taste Radol’ca restaurants. I know, it’s hard to know where to start! 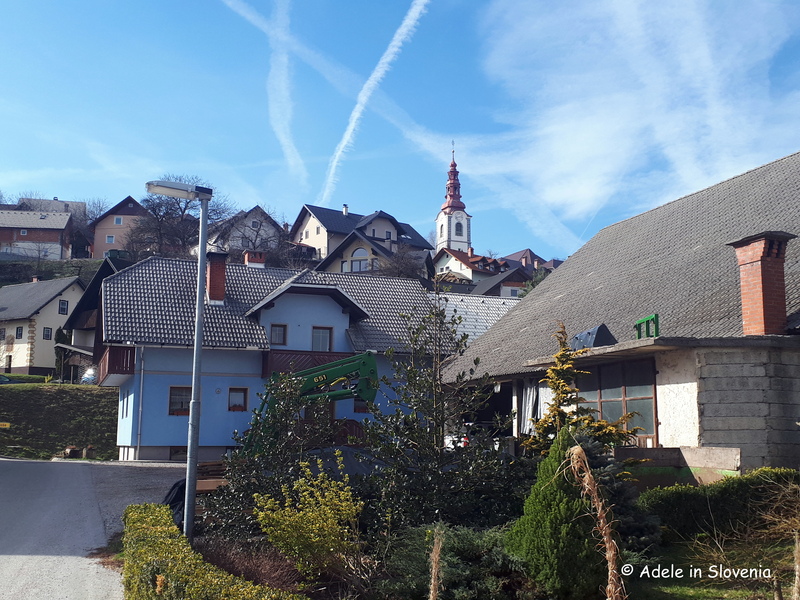 The town of Brežice, in the south-east of Slovenia, is framed by the Gorjanci mountain range, is the location of the confluence of the Sava and Krka rivers, home to the magnificent Brežice Castle and other sights of interest, as well as being close to Bizeljsko and the Bizeljsko-Sremič Tourist Wine Route and the Čatež Thermal Spa. 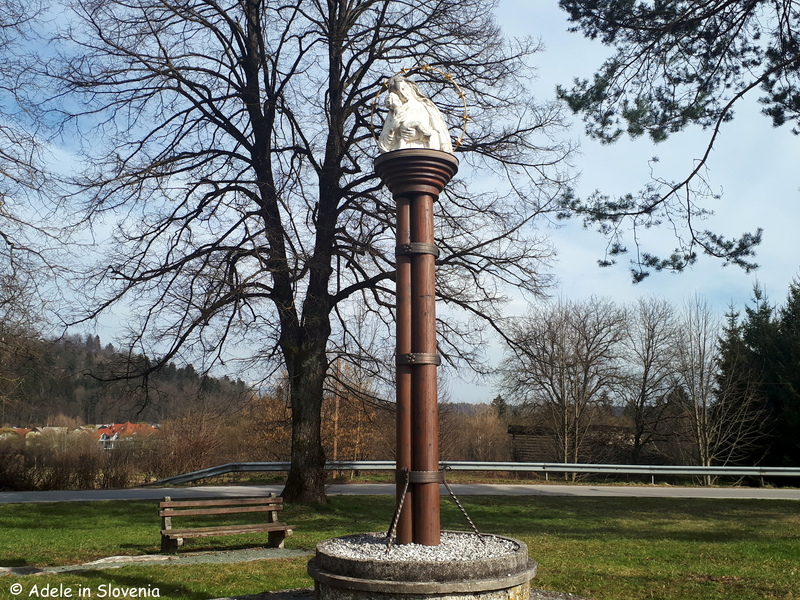 During my stay at the Čatež Thermal Spa, I took time to ‘Discover Brežice’ – as the town’s tourism slogan goes. 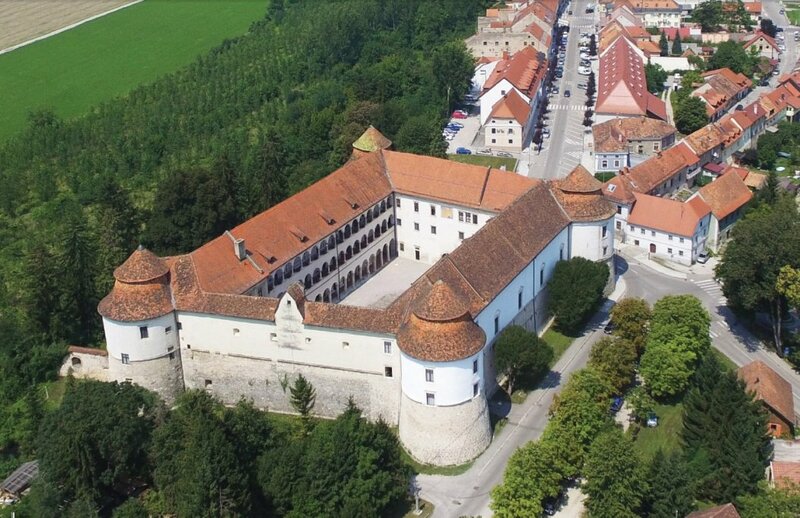 I set off by bike and first headed to the Brežice Castle and Museum, which is without doubt the jewel among the town’s historic buildings. The Renaissance castle was turned into a residential castle by the aristocratic Attems family in the late 17th/early 18th century. 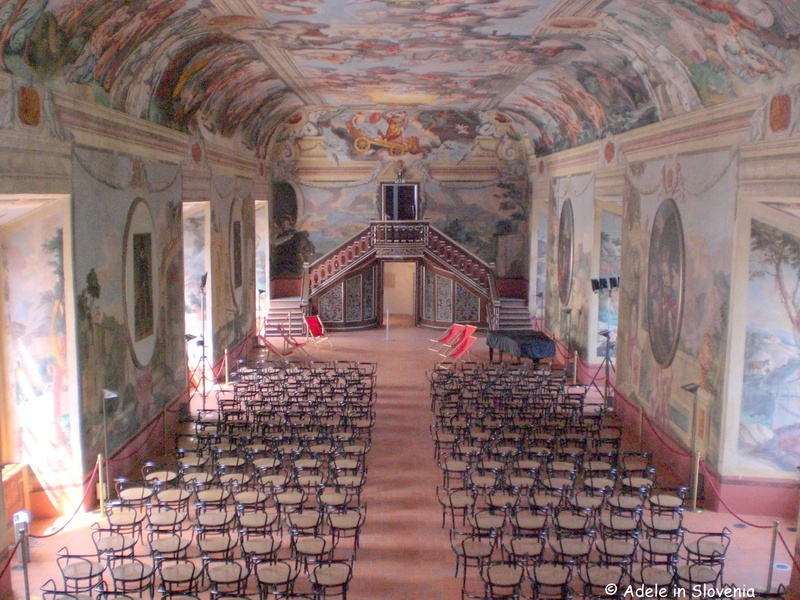 The Baroque painted Knights’ Hall is most definitely the pièce de résistance and really has to be seen to be able to appreciate its full magnificence and the vibrancy of colours. 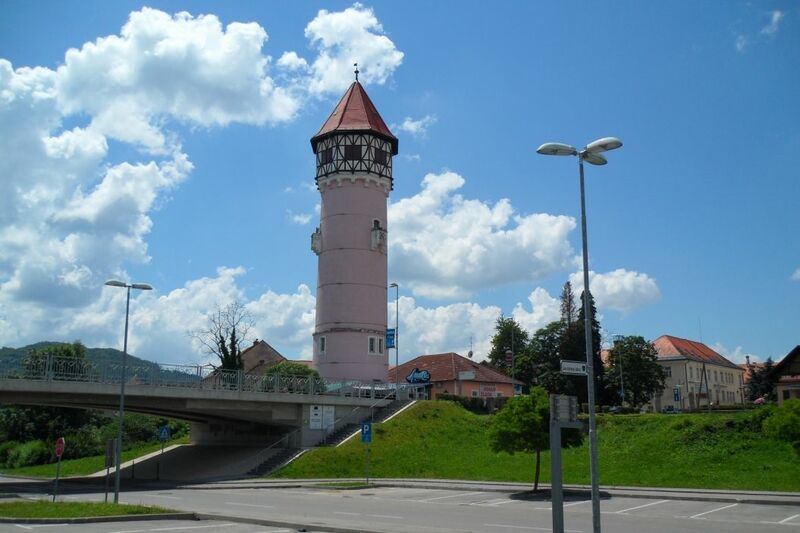 The 46 metre-high Brežice Water Tower was built in 1914 in order to provide the town with water. It no longer serves its original purpose but remains the most visible and well-known of the town’s landmarks. Today you can sit in the café on the ground floor and look up to enjoy the view! 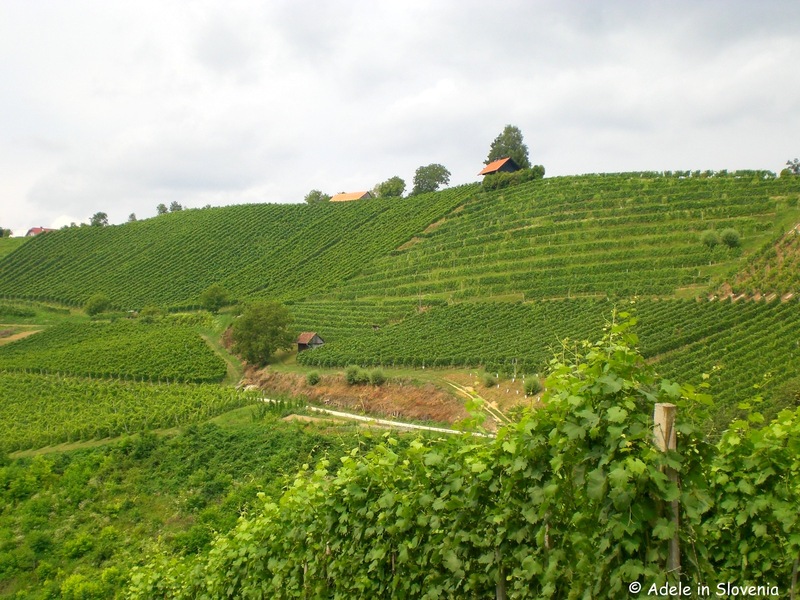 Whilst in the area you simply must drive, cycle, or walk, along part of the Bizeljsko-Sremič Tourist Wine Road and pay a visit to a ‘repnice‘ – quartz sand caves which are nowadays used for storing wine. From Brežice it took around 45 minutes by bike to reach the Najger repnice. The area’s landscape has an almost Tuscan feel to it and, although I was cycling on main roads, traffic was light and it was a pleasurable and scenic ride. 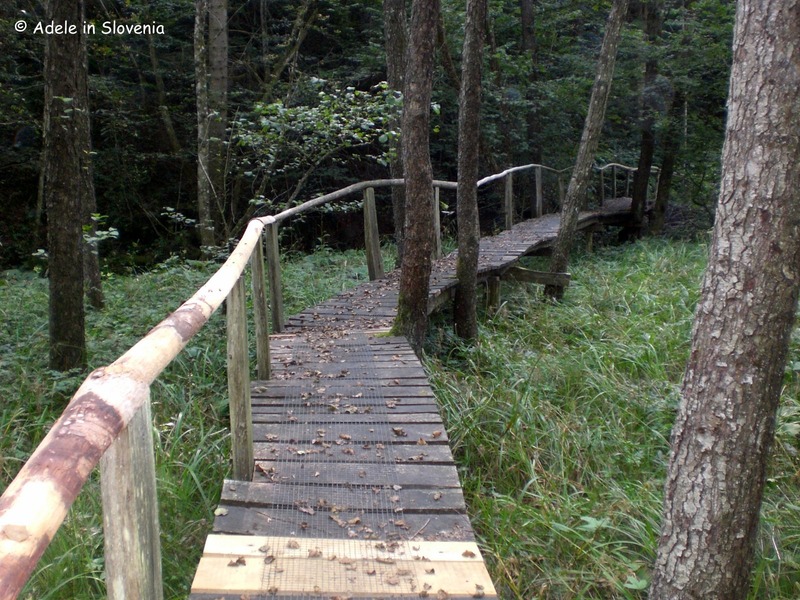 The area is part of the Kozjanso Nature Park – one of the oldest and largest protected areas in Slovenia. Not really knowing what to expect, I found the Najger repnice absolutely fascinating. 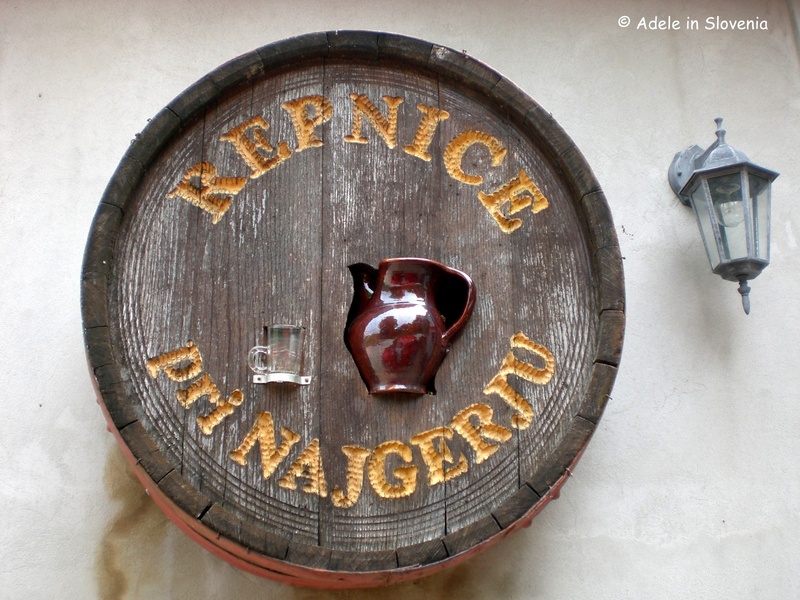 Repnice caves were originally used for storing turnips (‘repa‘ in Slovene, hence the name ‘repnice‘) during winter, at the time when turnips were the main fodder for livestock. 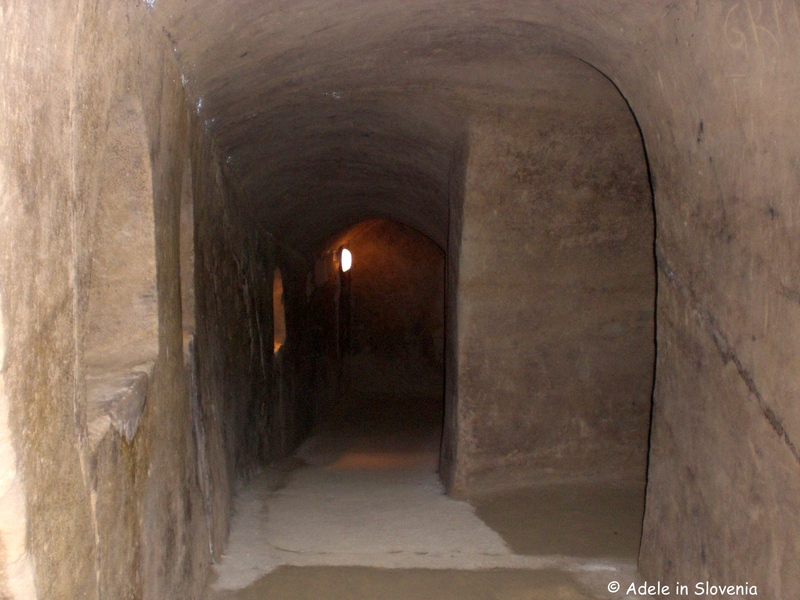 These days, the caves, made from dug out quart sand, are used for storing wine and visitors have a chance to taste and buy some of the excellent home-made wines, accompanied by a plate of home-produced cheese and dried meats, or other homemade delights. 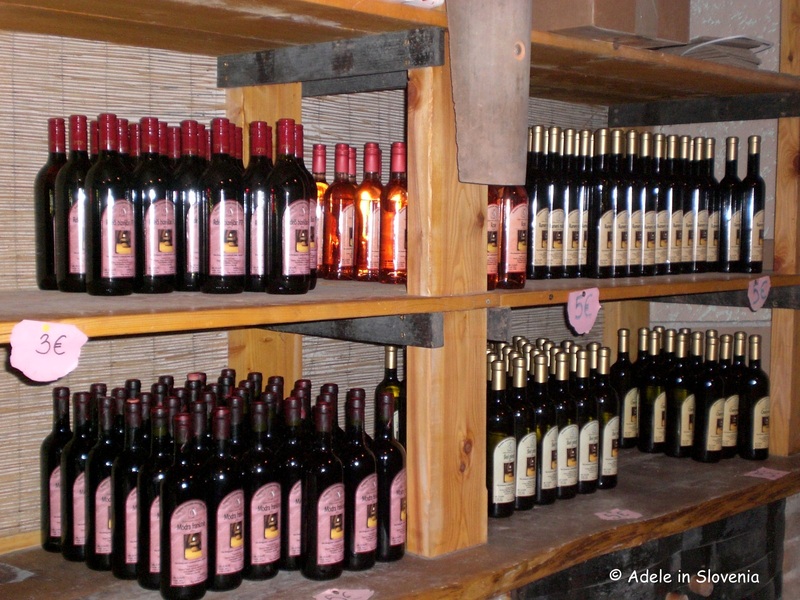 The rooms inside the caves are at a constant temperature, offering perfect conditions for storing wine. 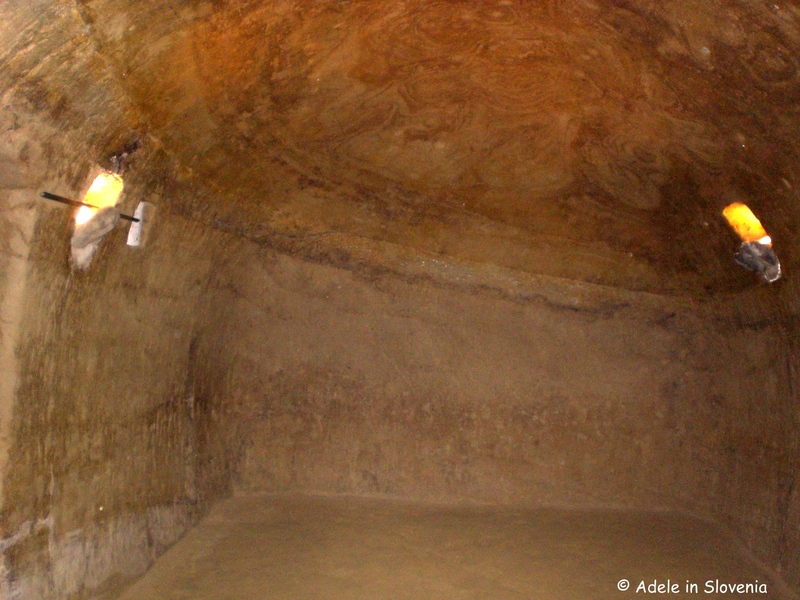 To really understand the marvel of these caves it is necessary to understand how much work went in to digging them out; for each small room it took around 3 months of working 8 hours per day. Now if that isn’t hard labour and dedication I don’t know what is. The results, however, were well worth it! If you look closely at the sandstone you can make out various natural shapes and patterns. Which animal can you see here? 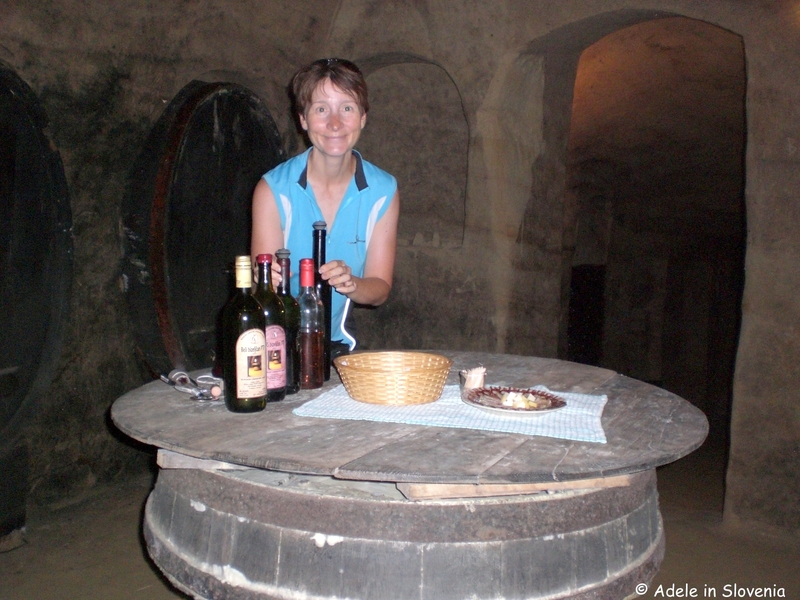 Following the tour of the cave there was also the chance to buy some of the home-produced wine, at more-than reasonable prices, which makes an idea gift or a treat for yourself – it was sweet muscat wine for me! In bygone days, boats and ferries regularly transported people and goods from one side of the Sava river from the Čatež Thermal Spa to the village of Mostec and back. 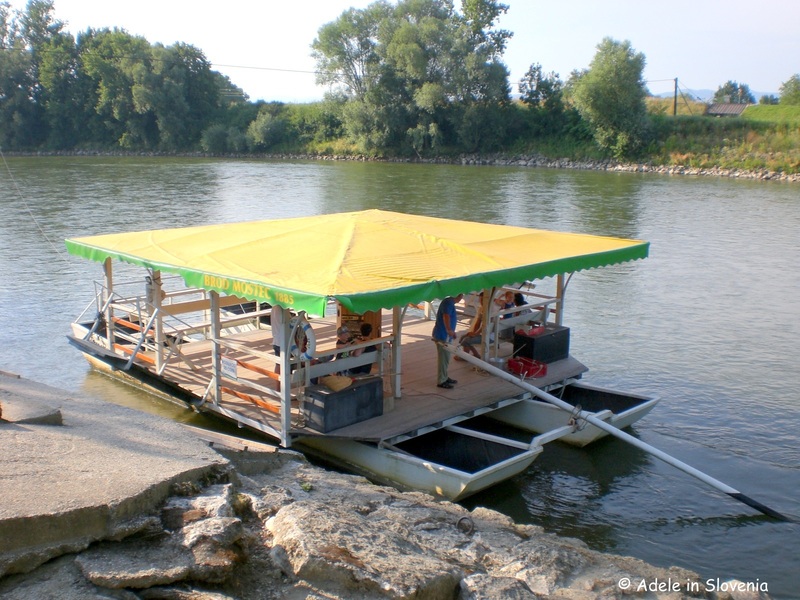 Nowadays, the special ‘brod’ ferries offer short pleasure trips along the river. 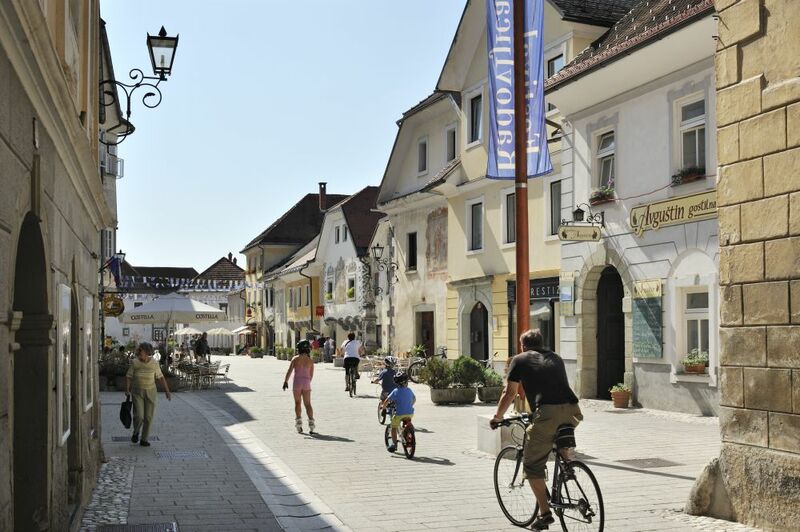 The 7-day Brežice My Town Festival, the largest festival in the Posavje region, takes place annually at the end of June and attracts thousands of visitors from Slovenia and neighbouring countries. 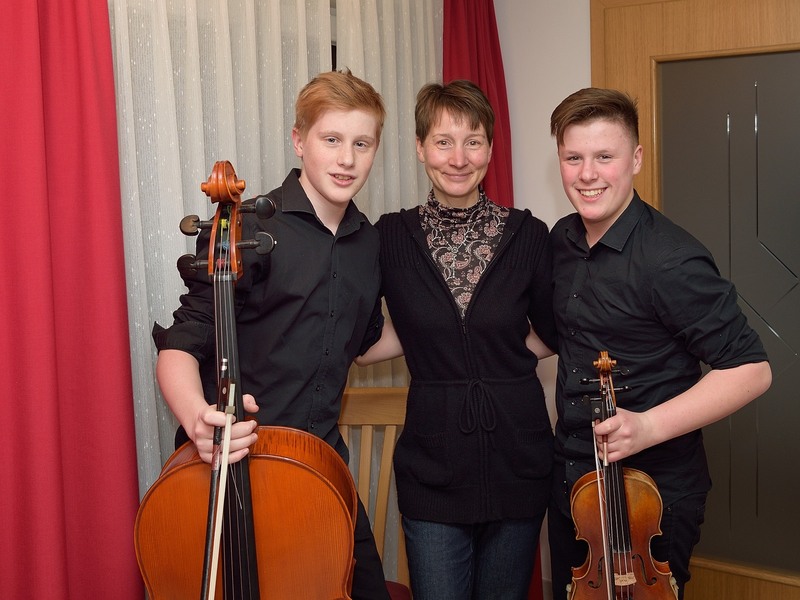 The festival programme includes a wide range of concerts, performances, activities for children, sports challenges and a chance to sample some of the best local cuisine.